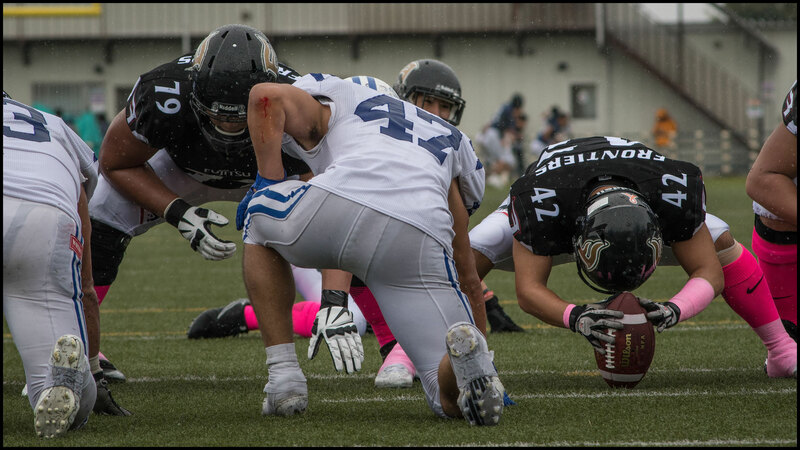 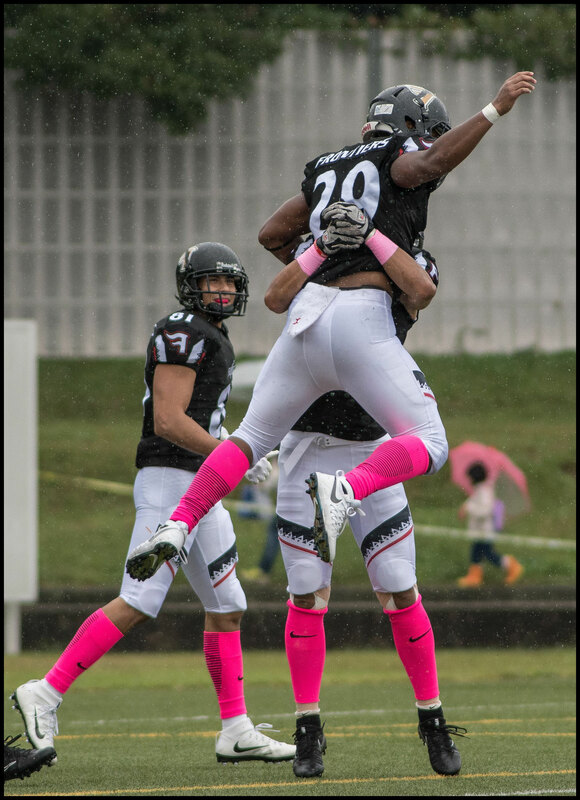 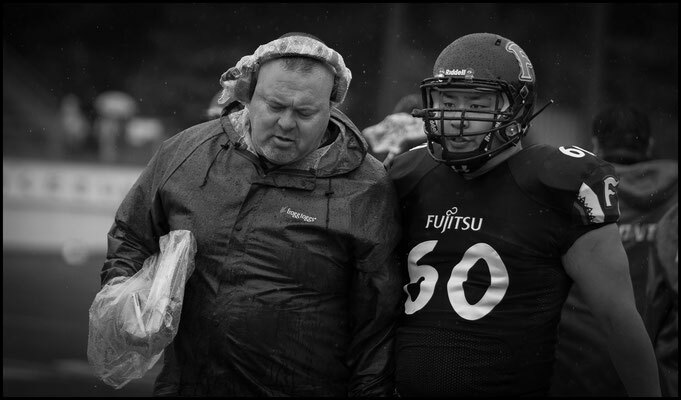 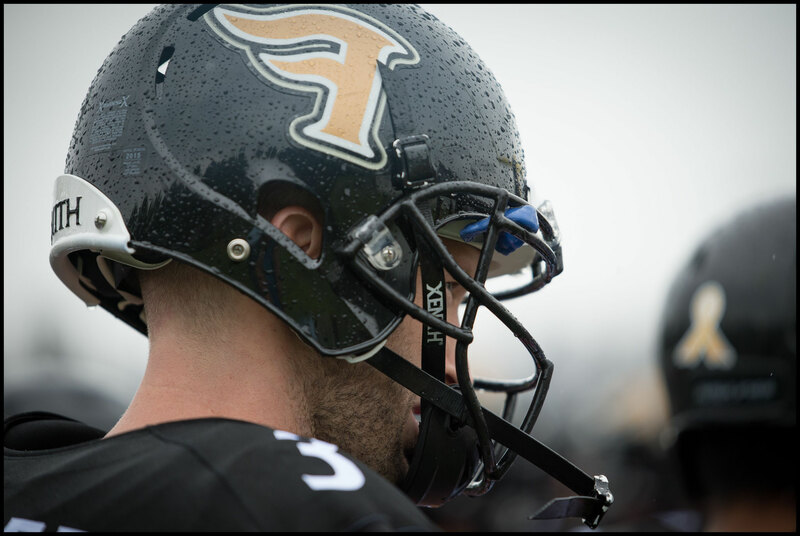 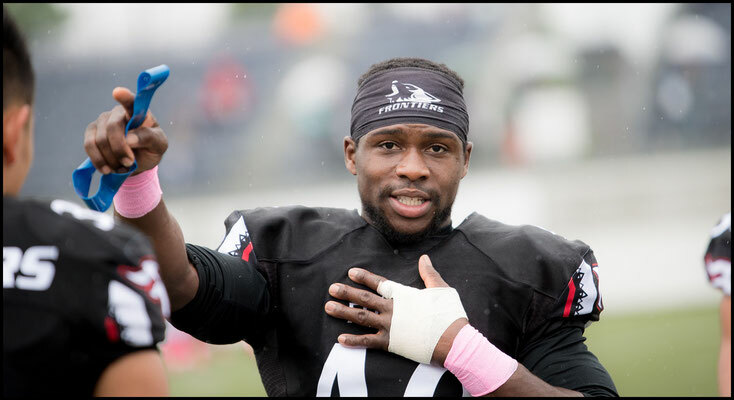 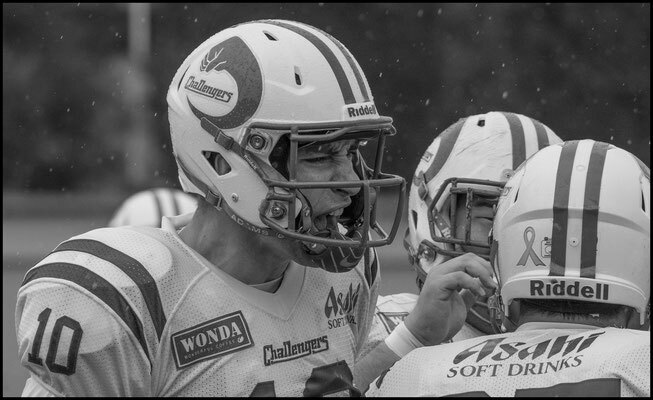 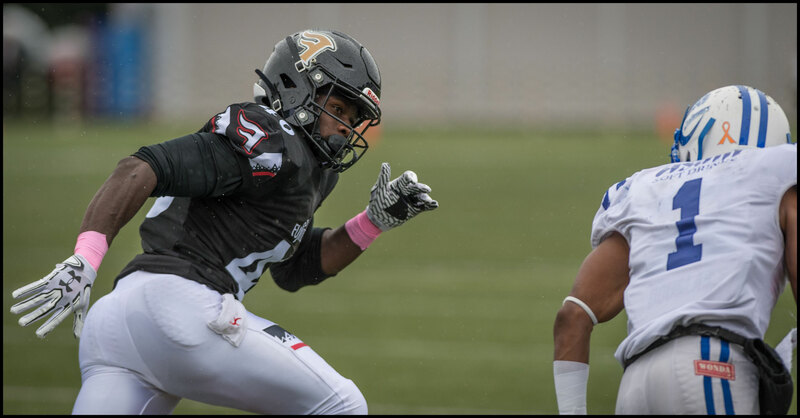 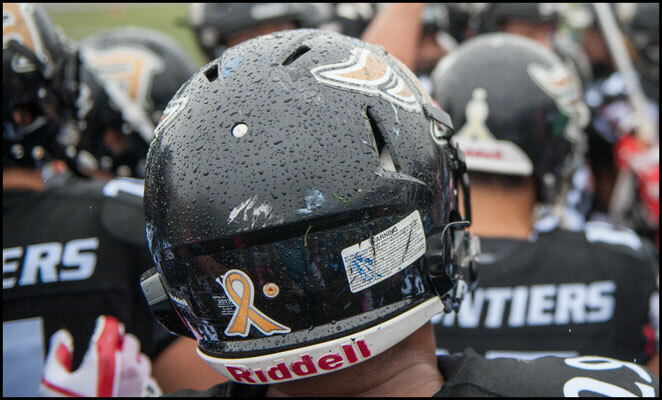 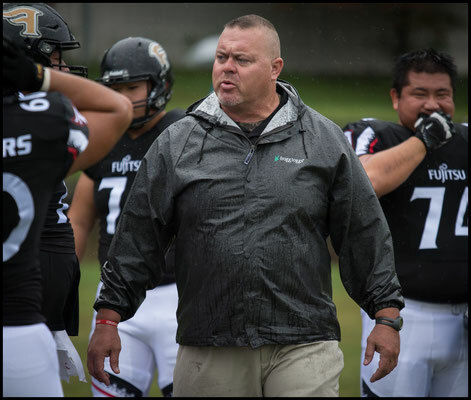 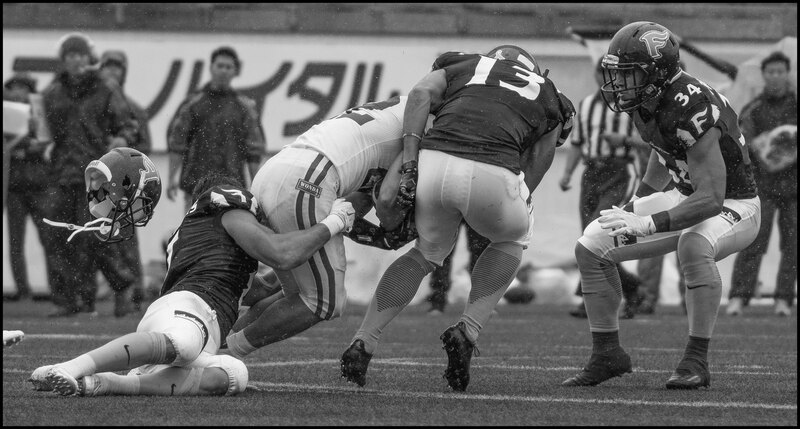 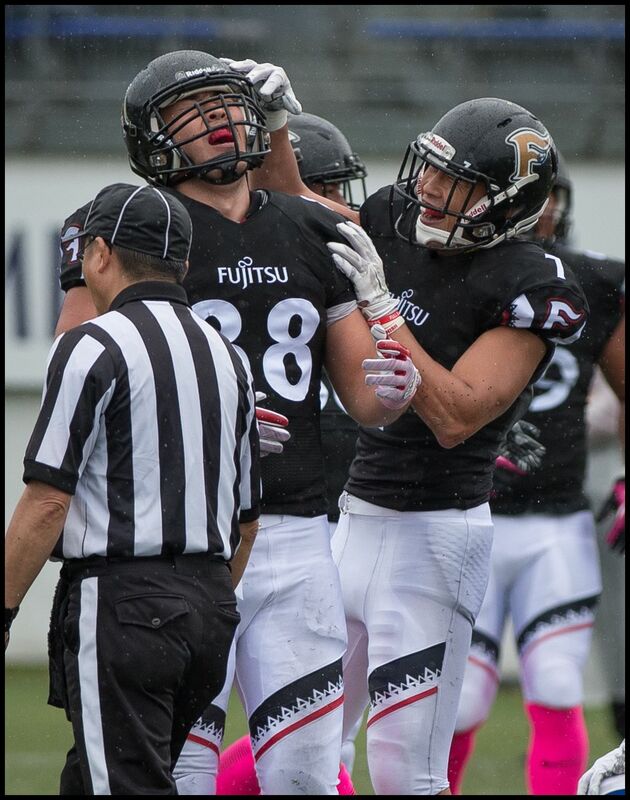 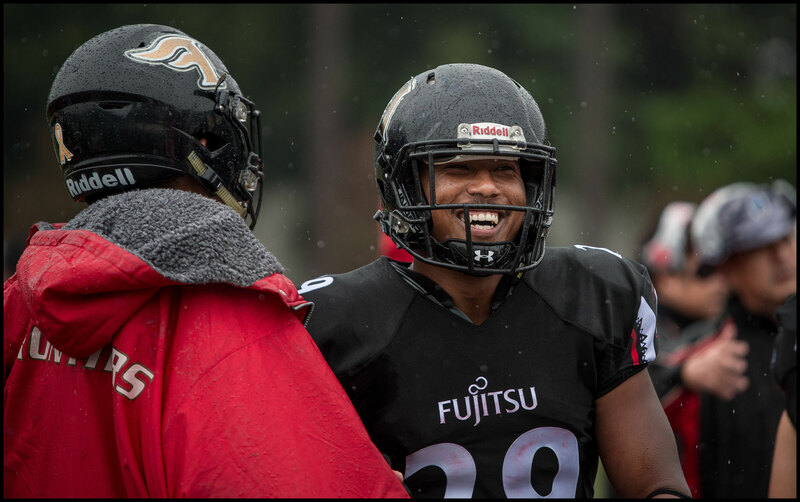 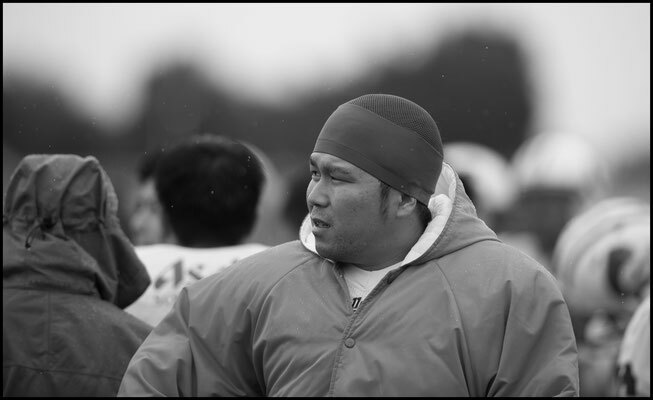 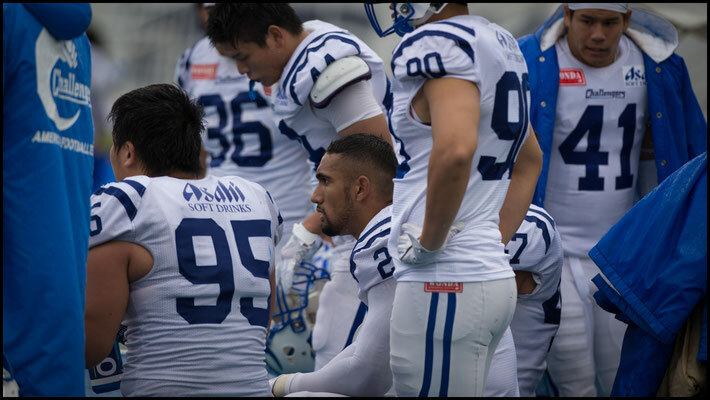 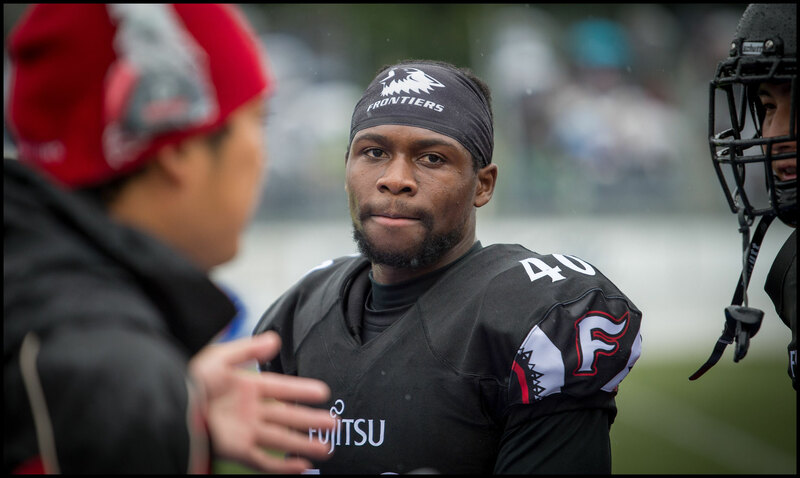 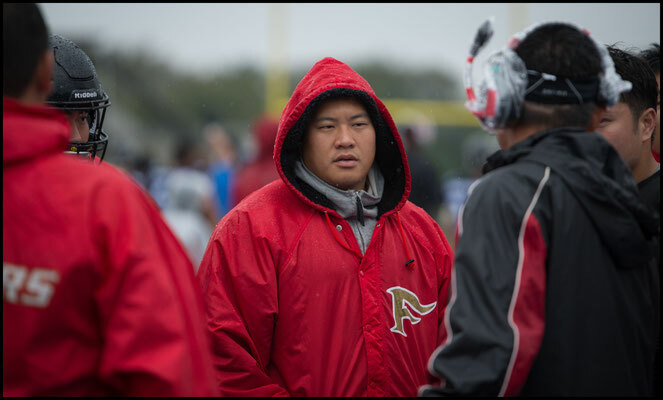 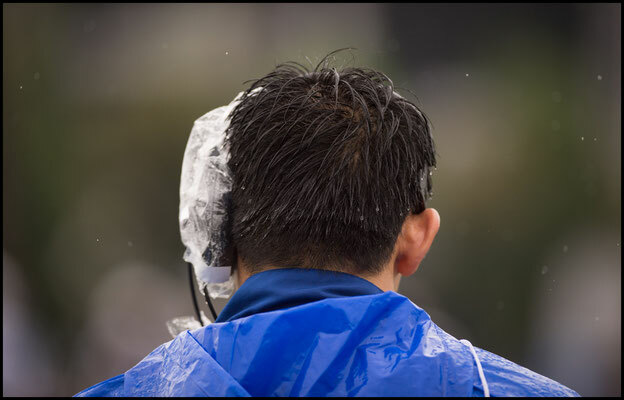 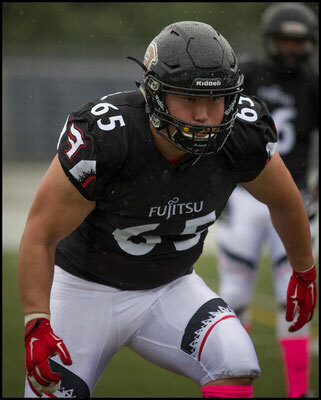 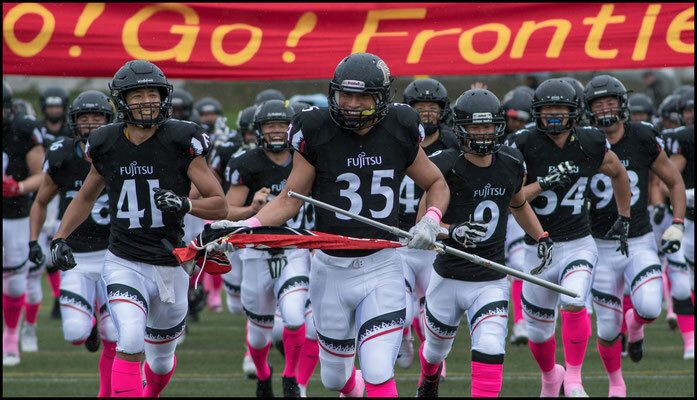 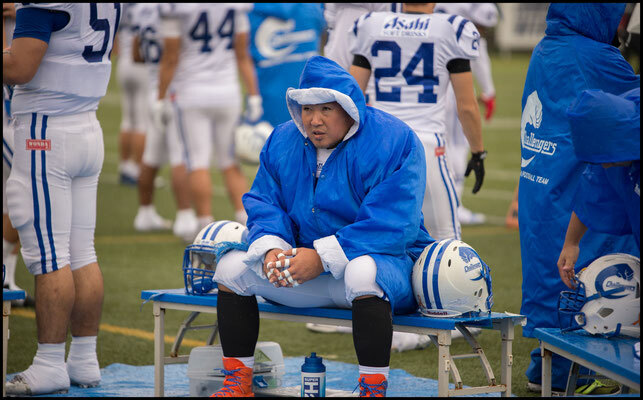 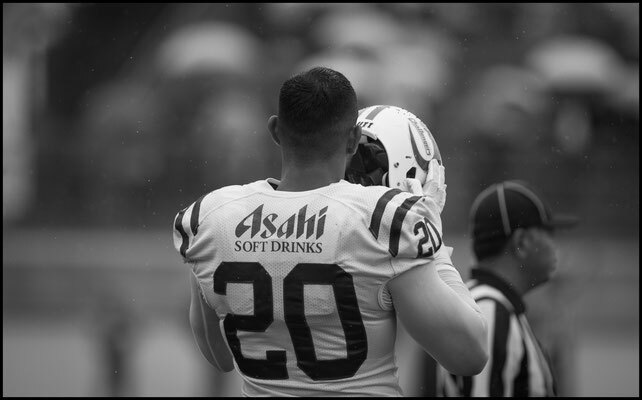 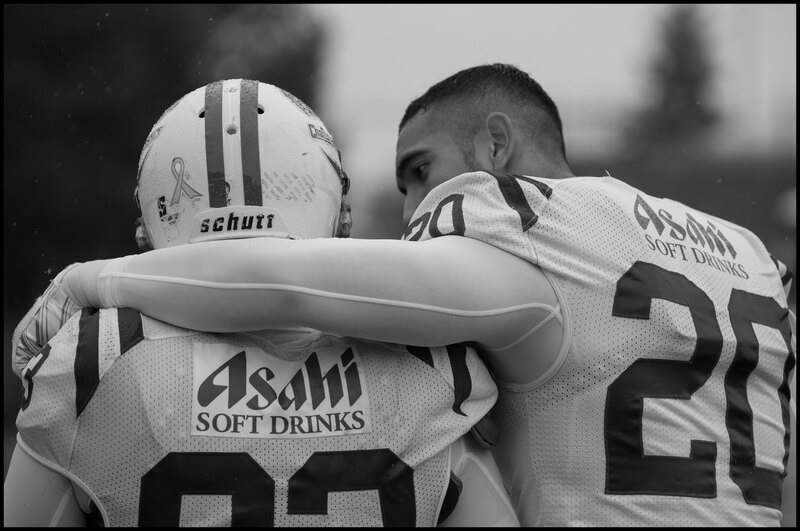 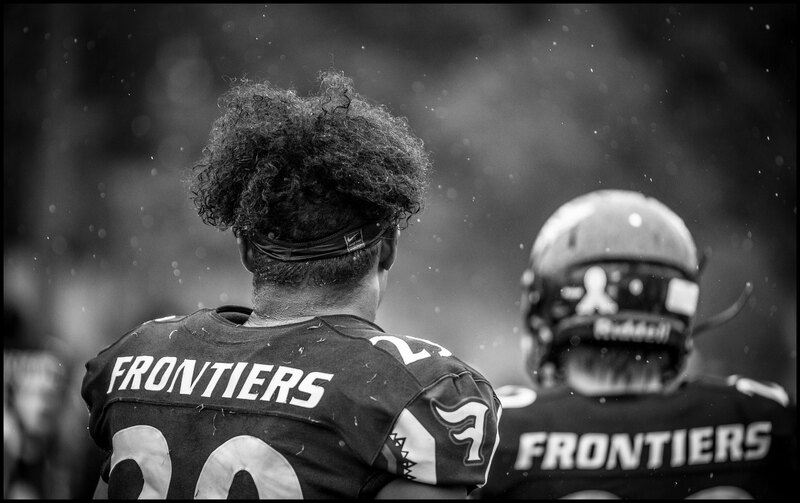 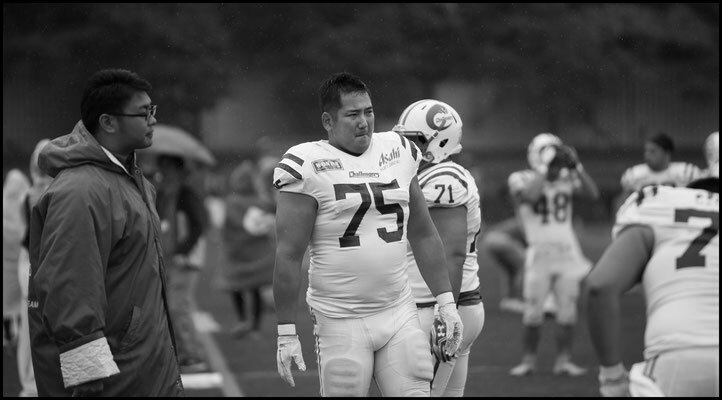 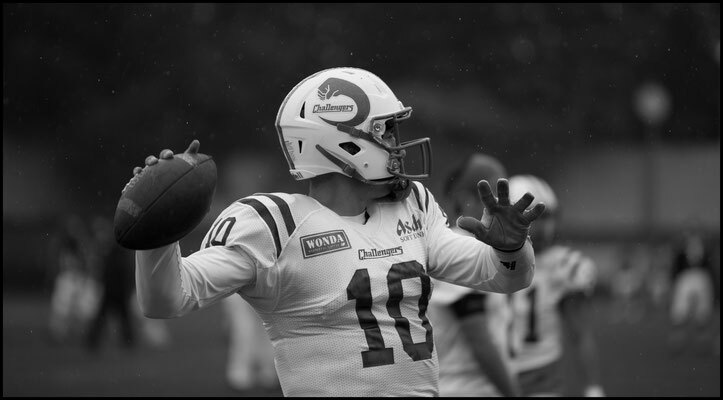 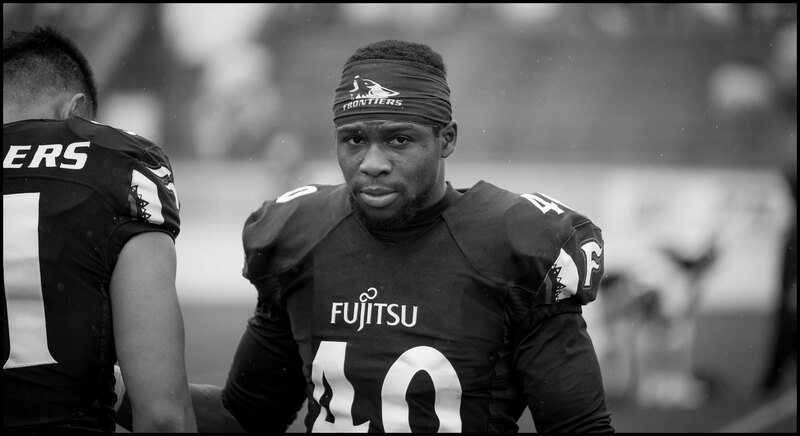 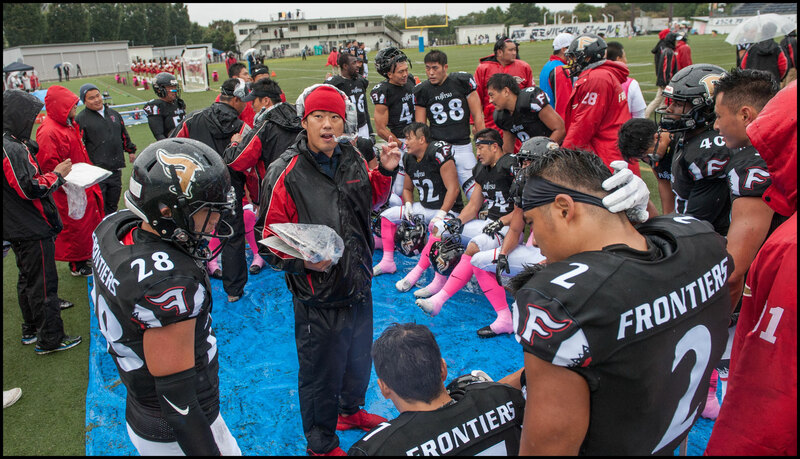 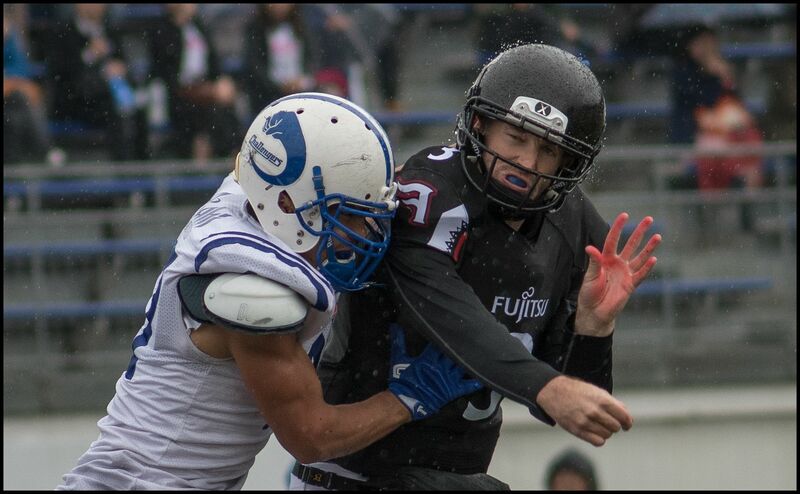 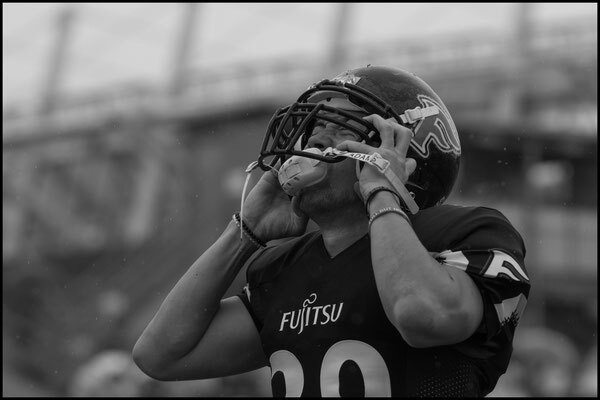 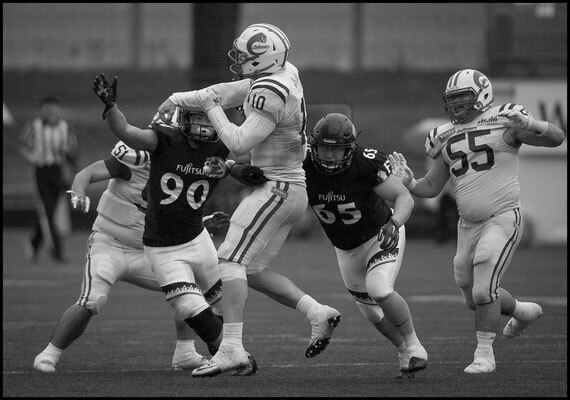 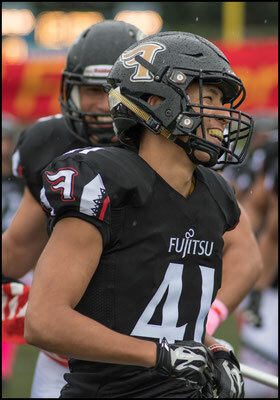 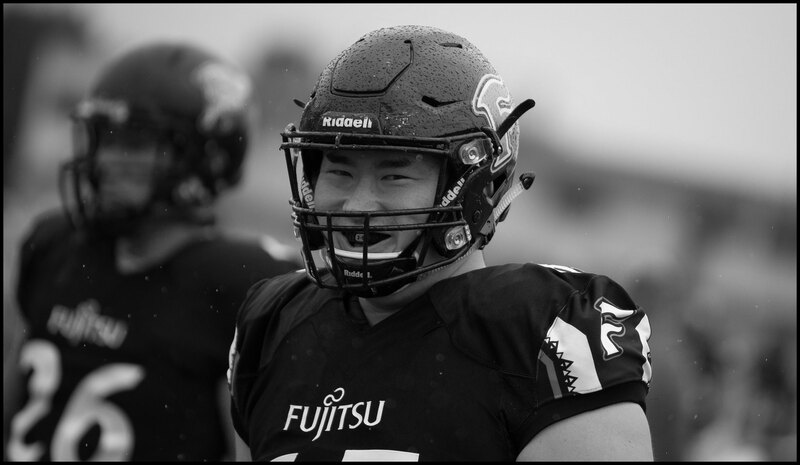 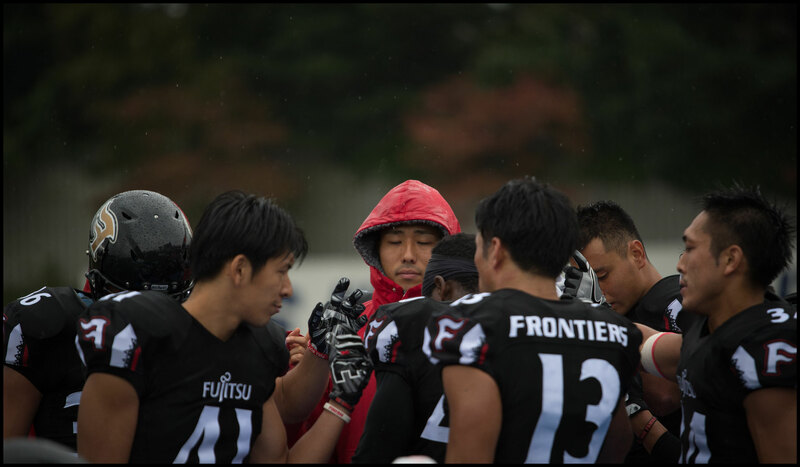 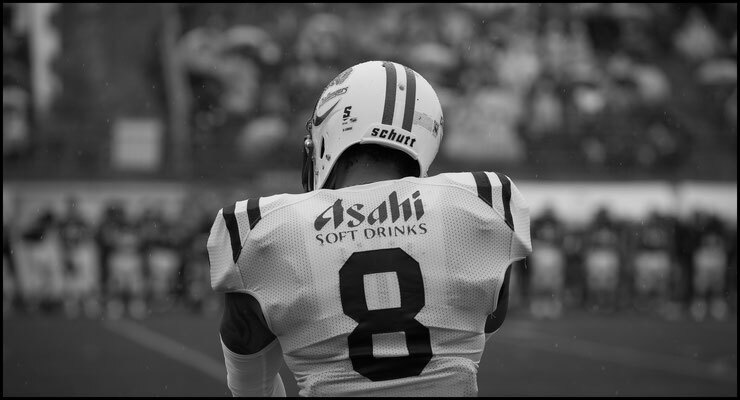 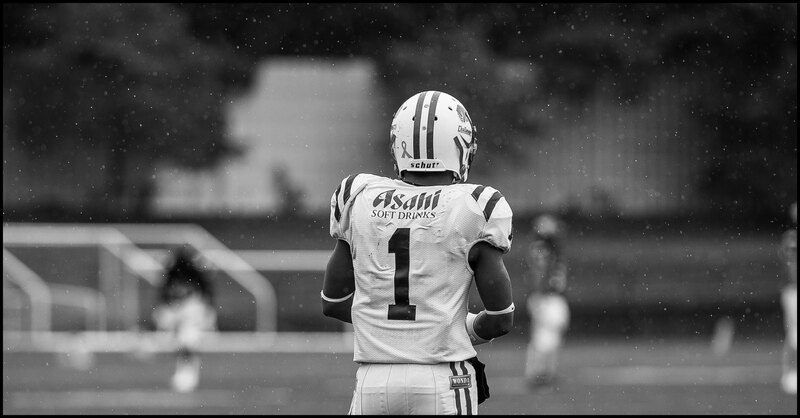 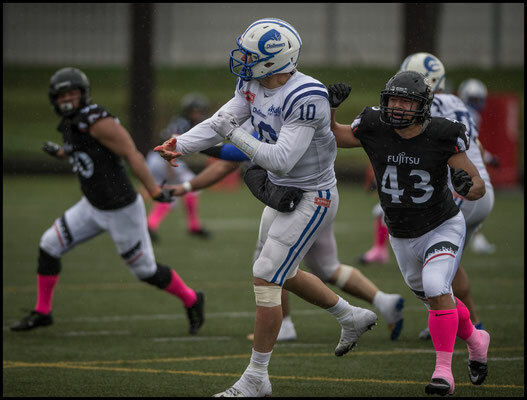 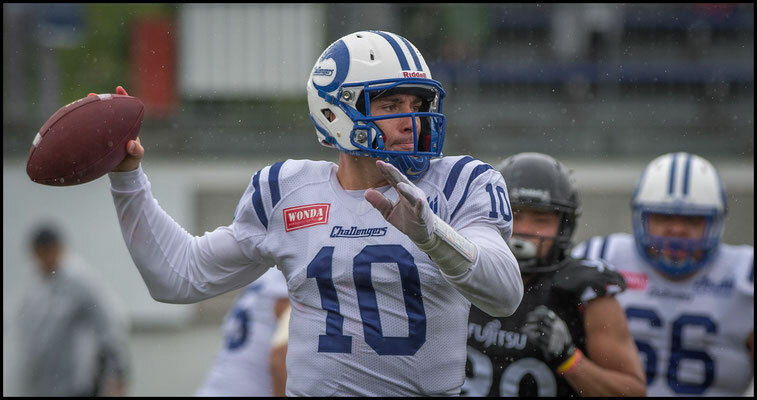 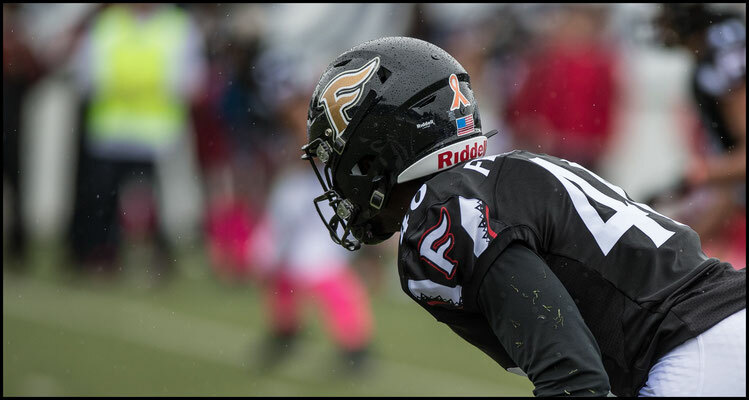 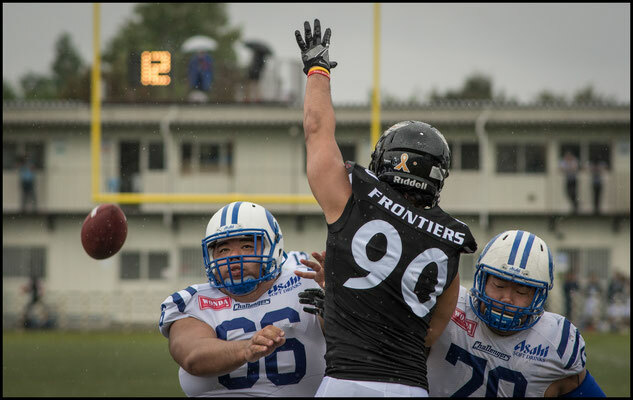 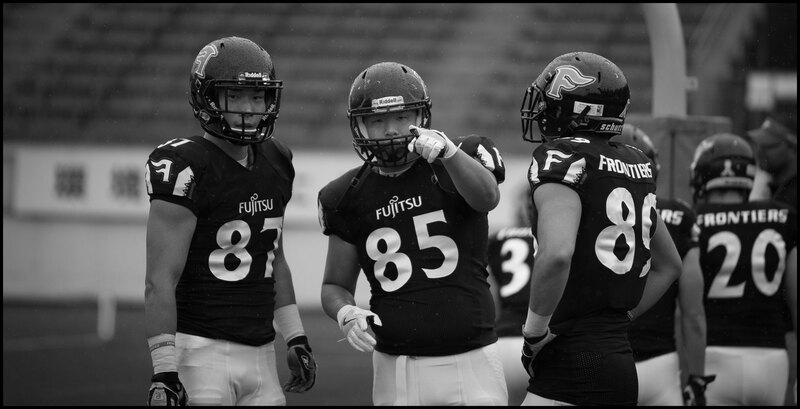 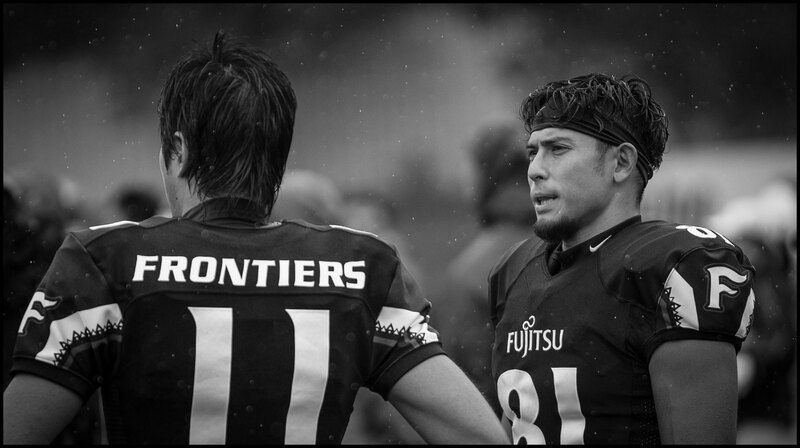 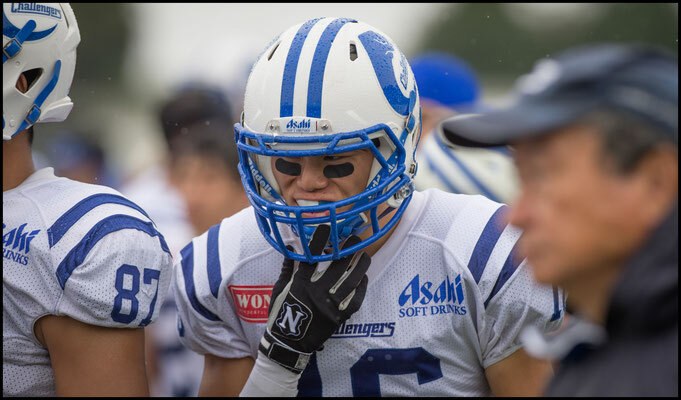 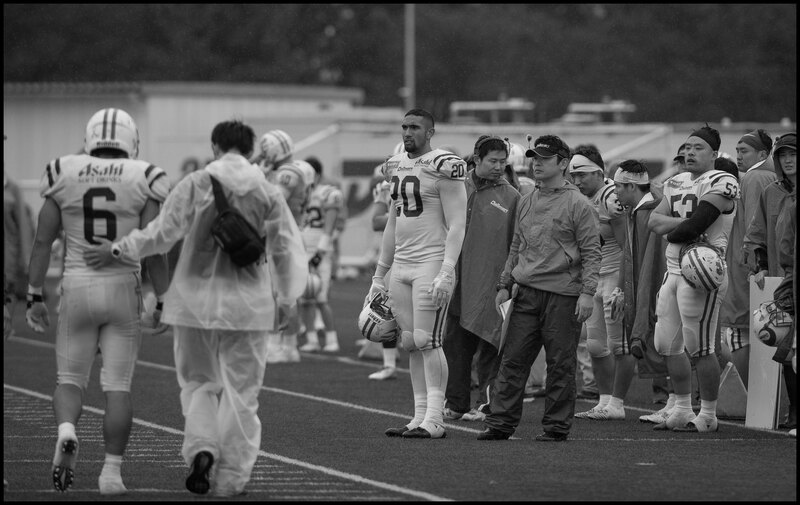 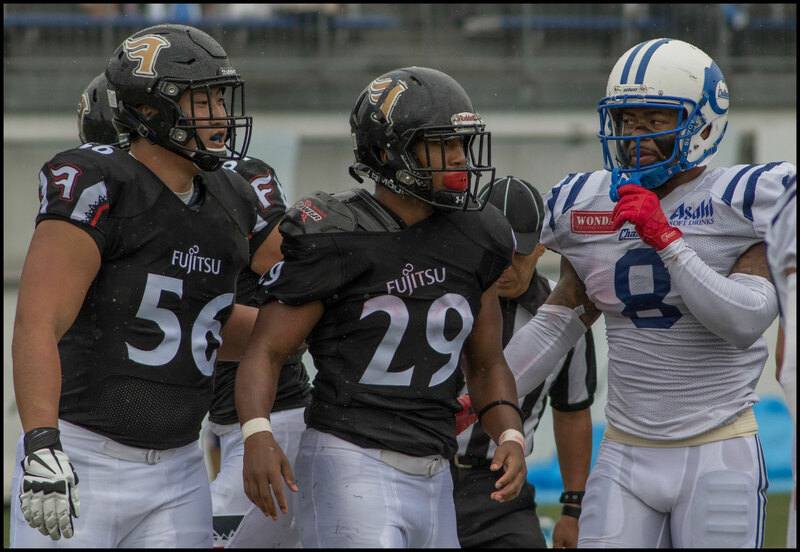 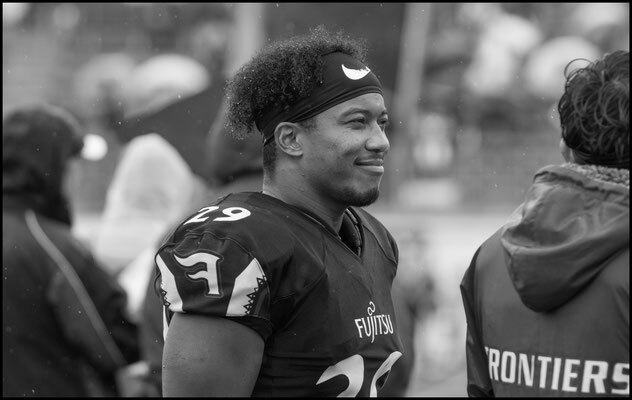 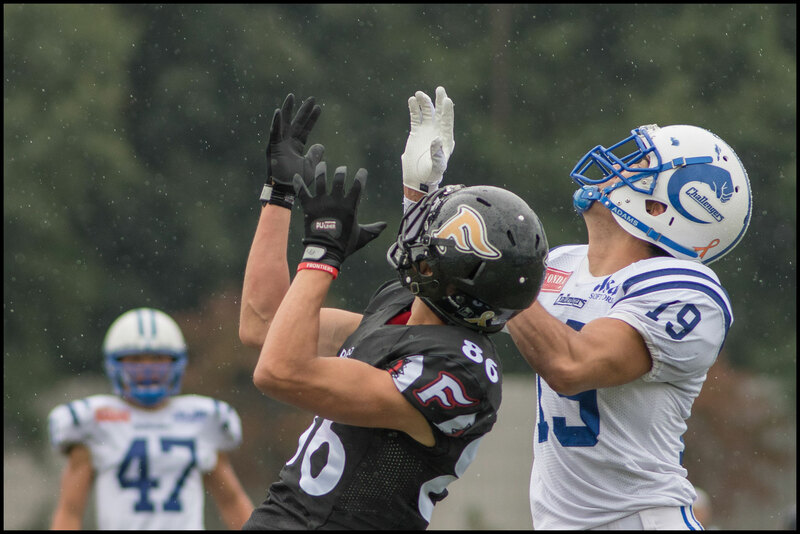 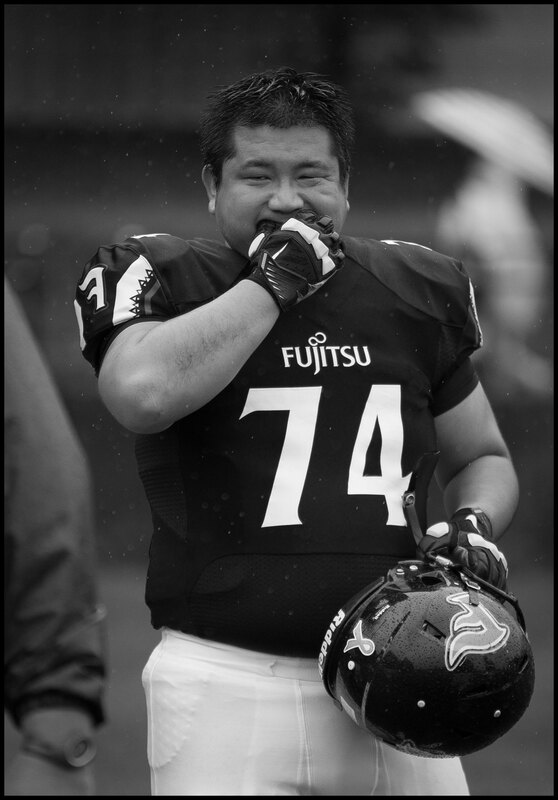 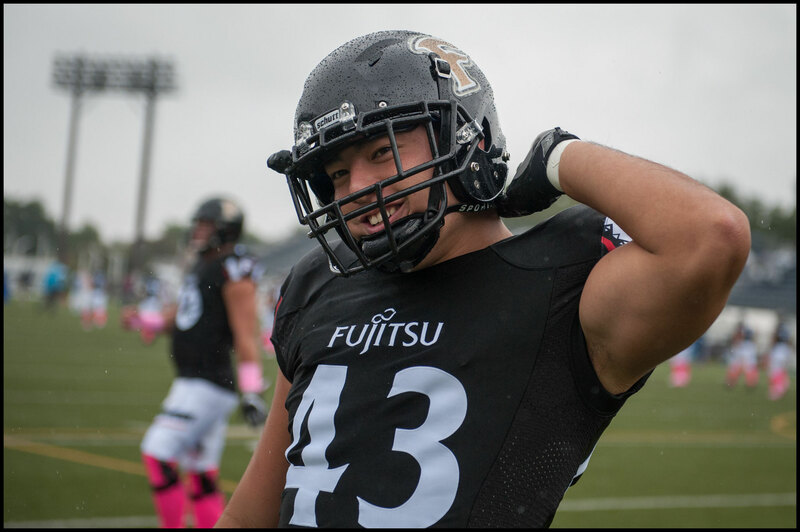 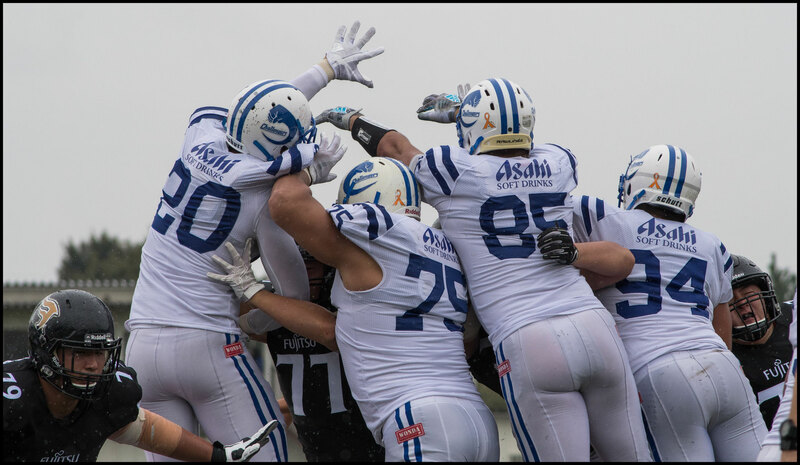 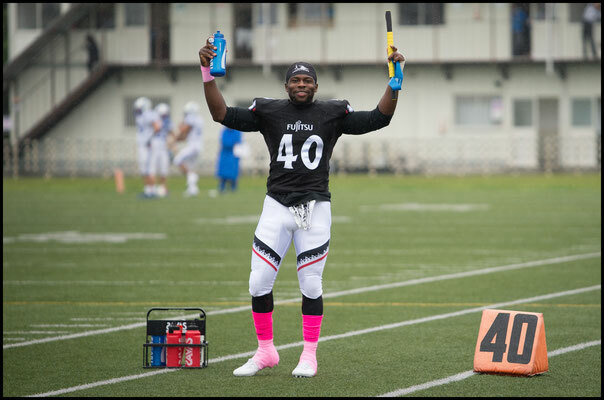 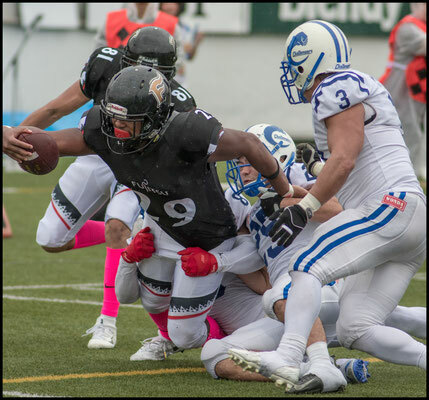 Fujitsu Frontiers started out hot, then coasted to a 44-13 win over Asahi Soft Drinks Challengers at a cold and rainy Amino Vital Field on Sunday. 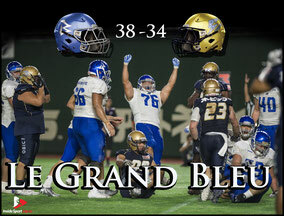 The game, while not close on the scoreboard, provided plenty of entertaining battles and was played at a pad-popping level of intensity. 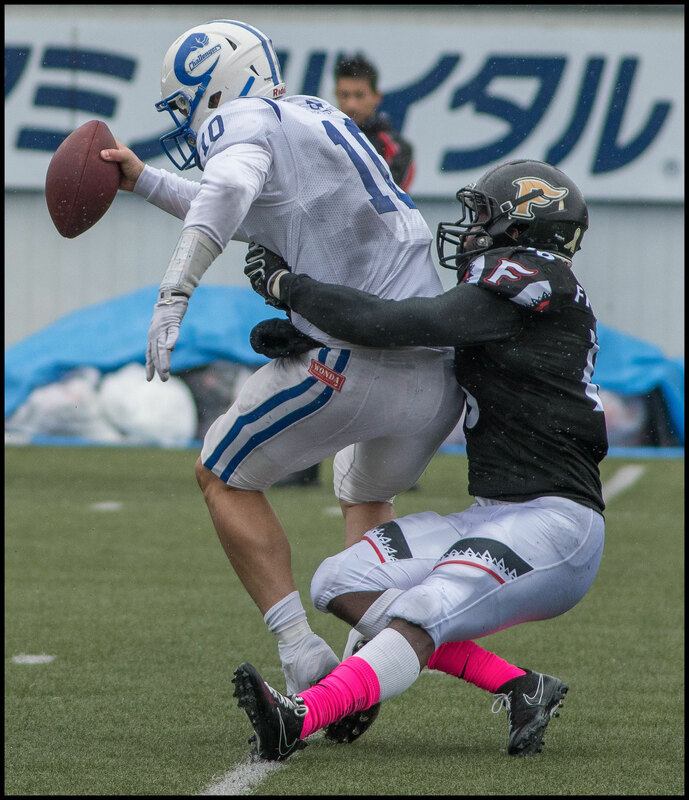 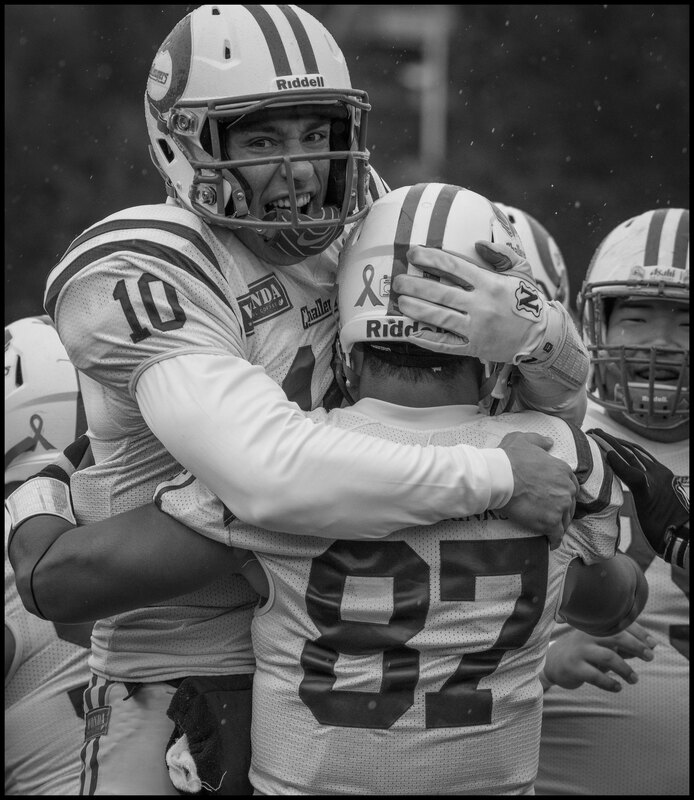 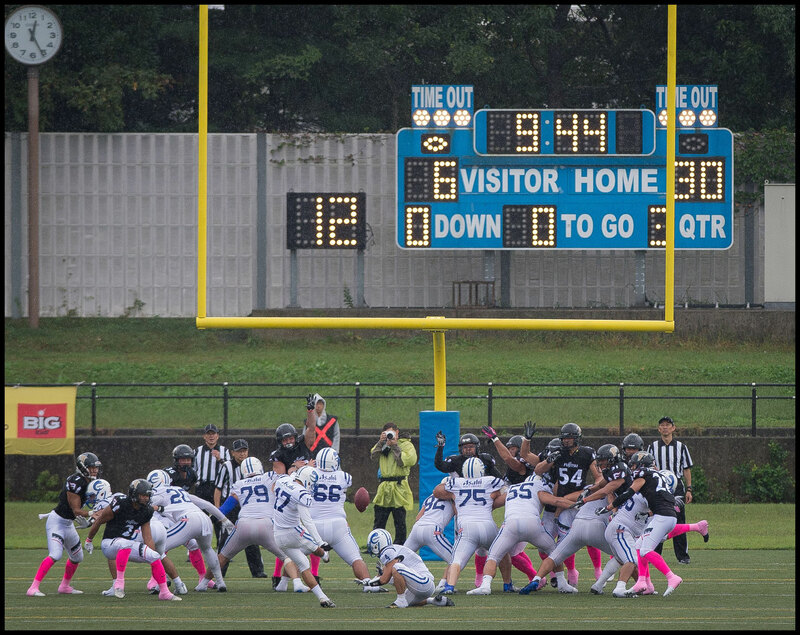 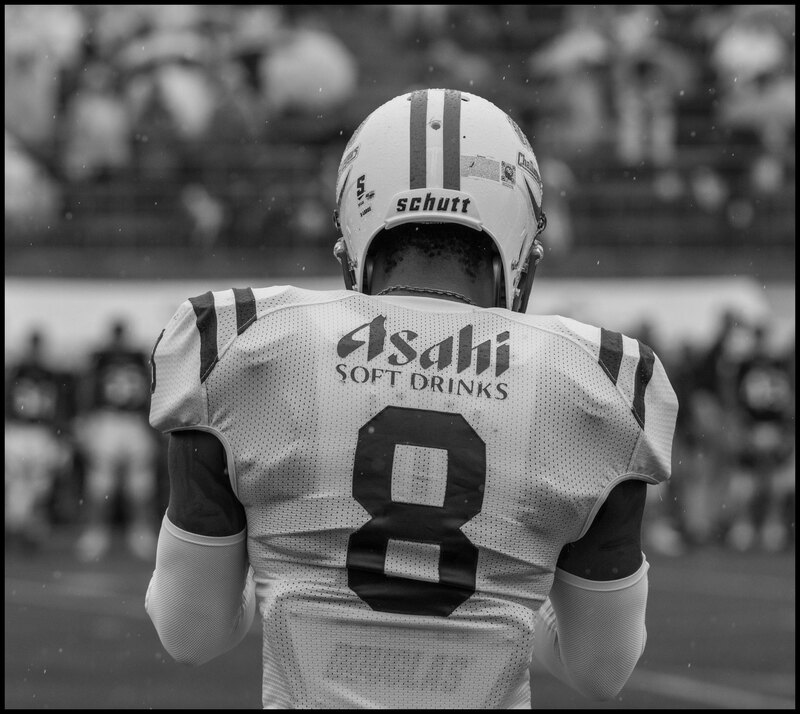 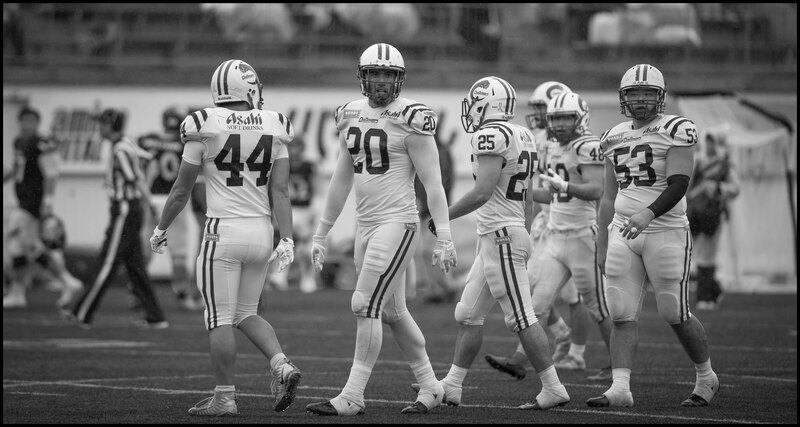 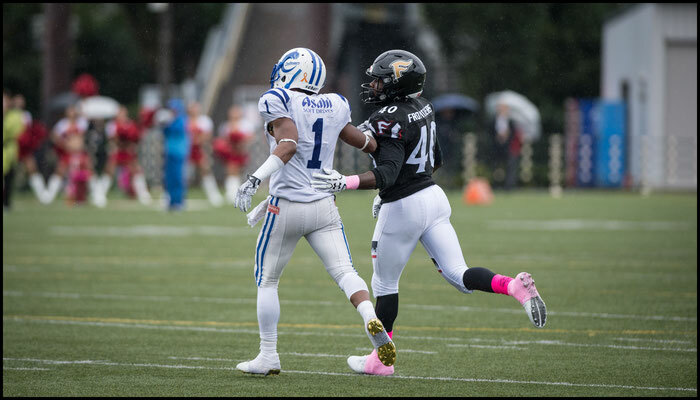 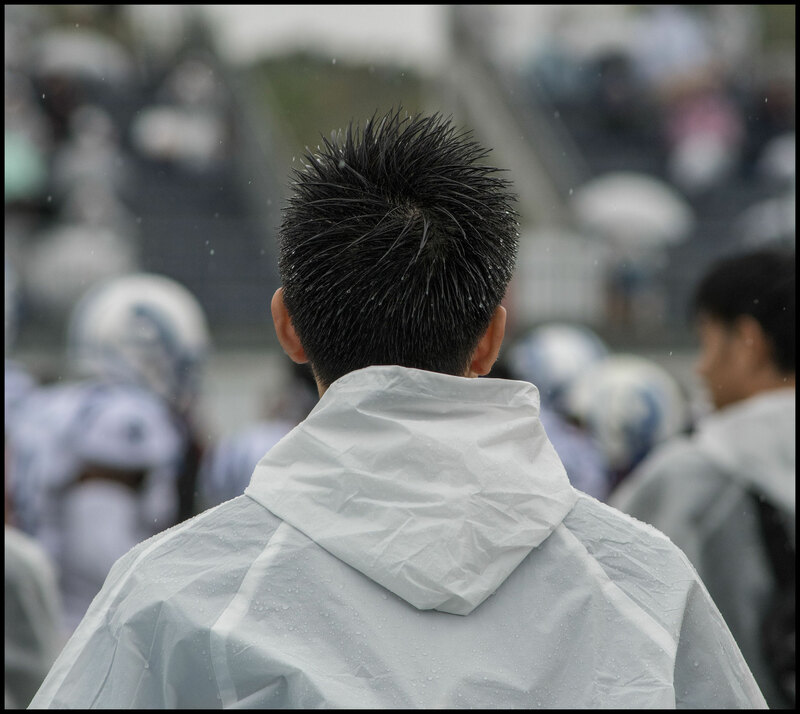 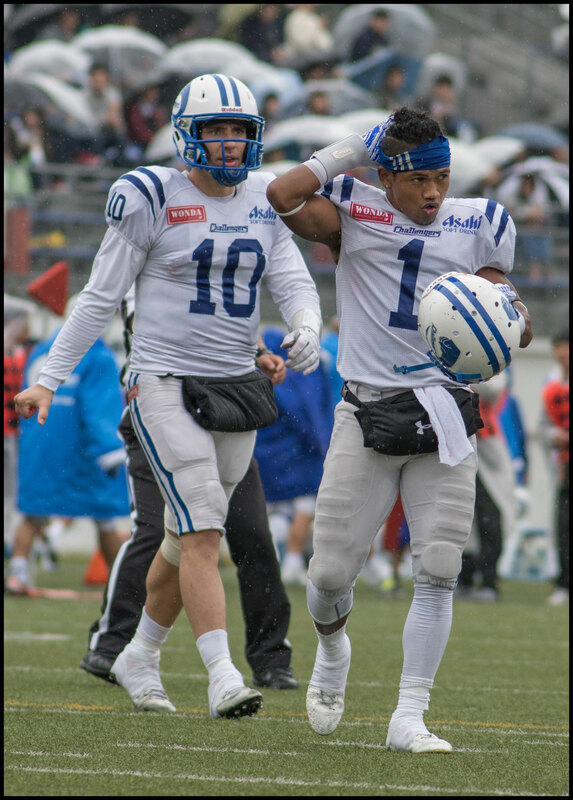 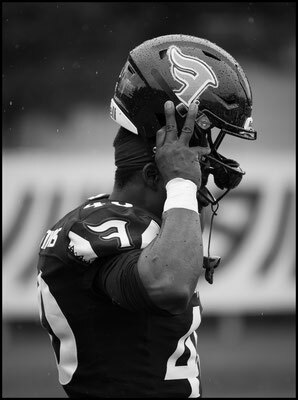 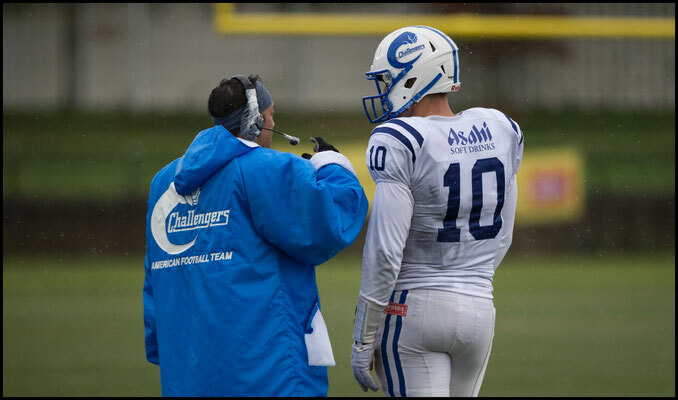 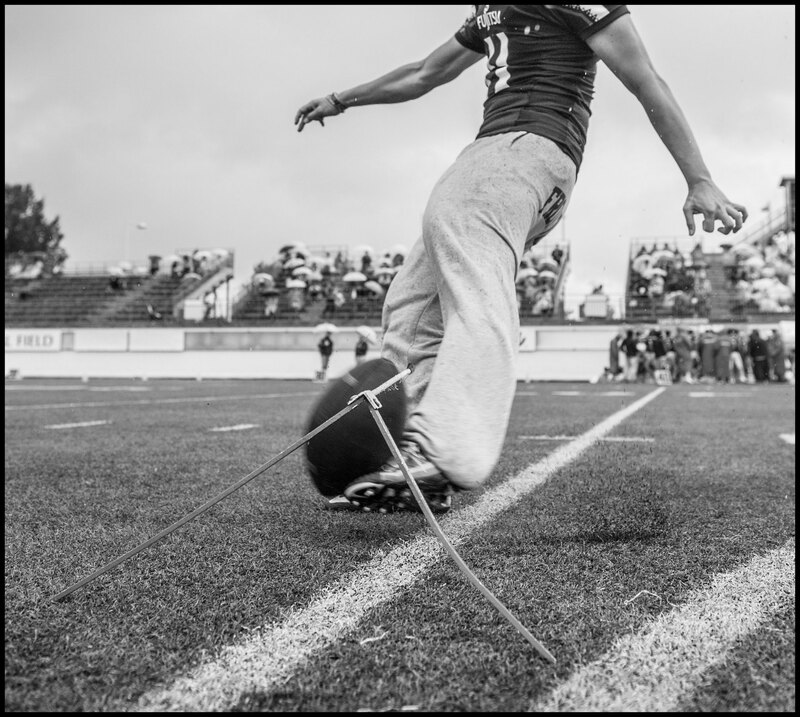 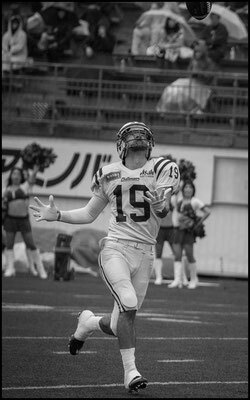 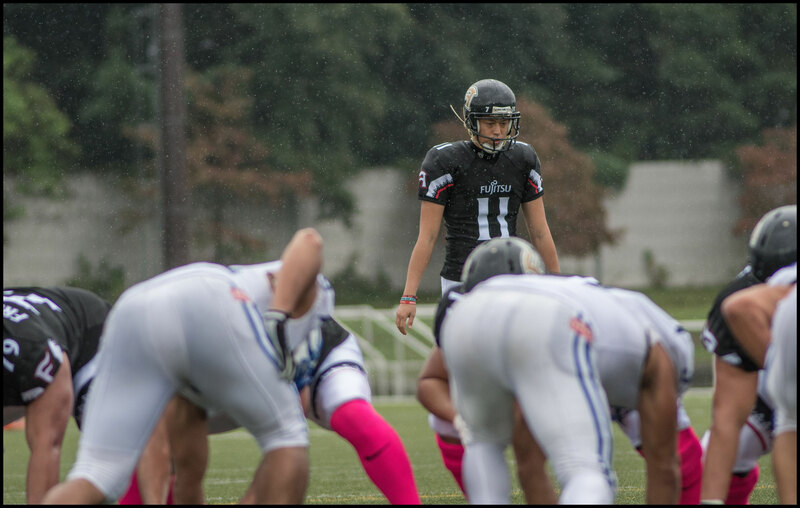 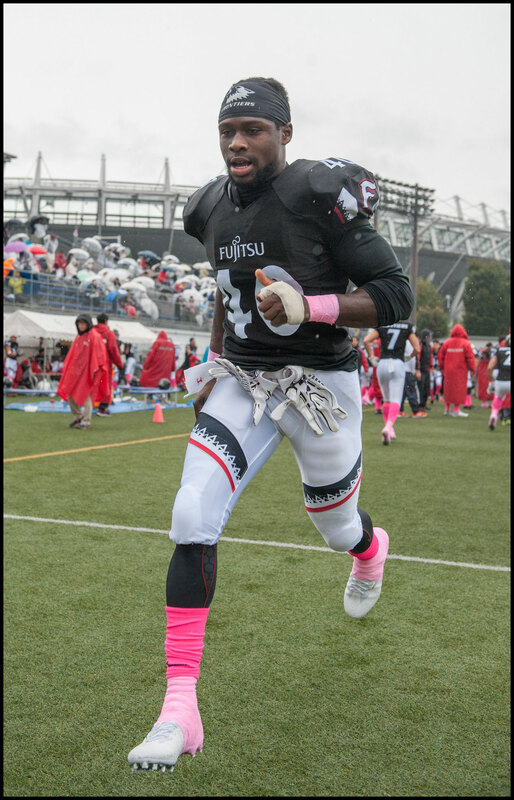 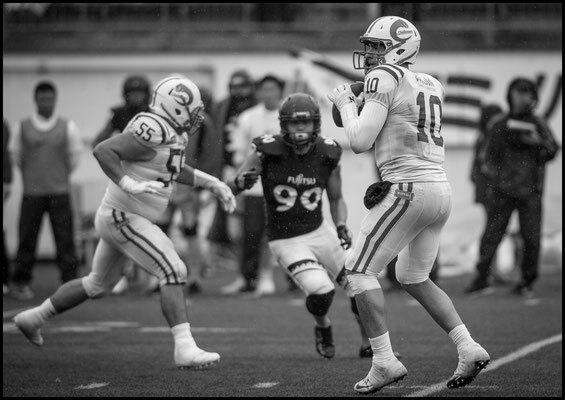 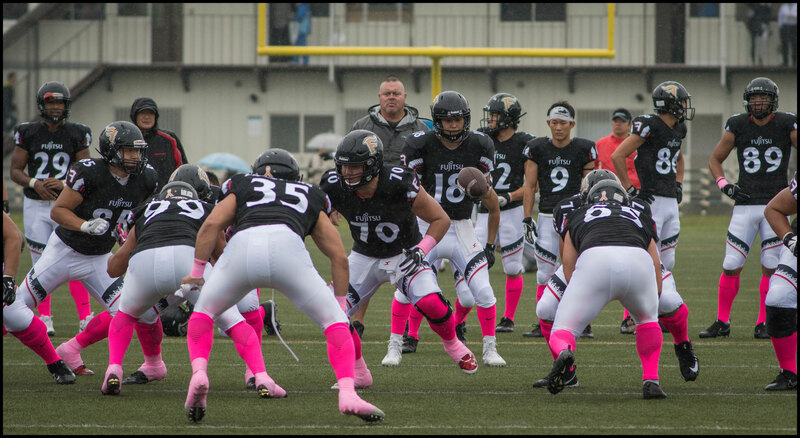 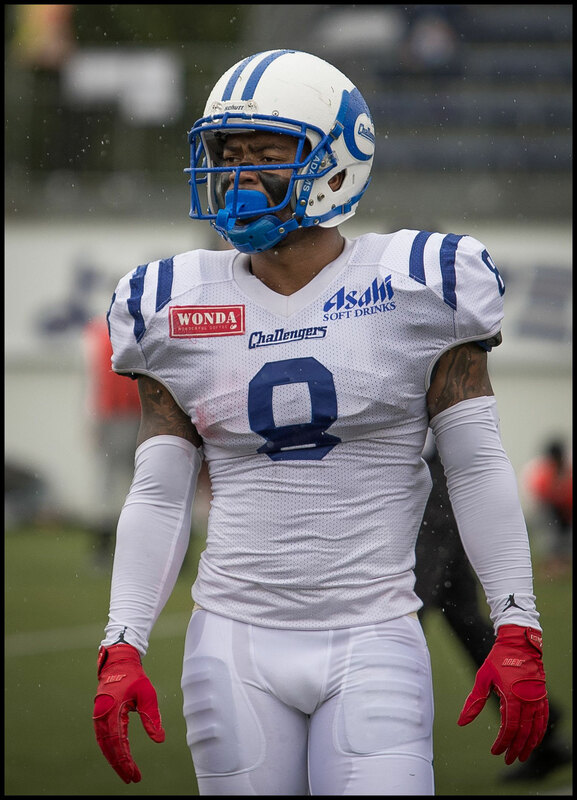 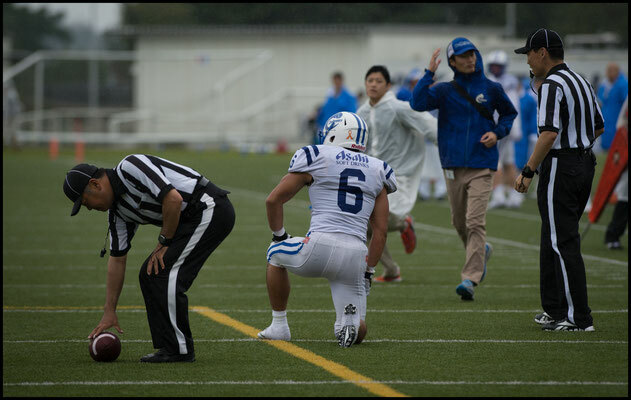 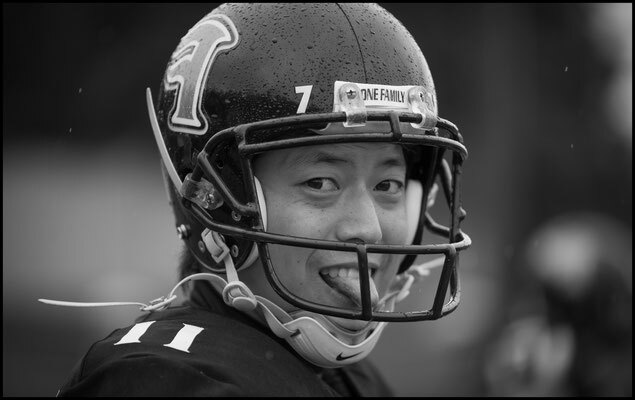 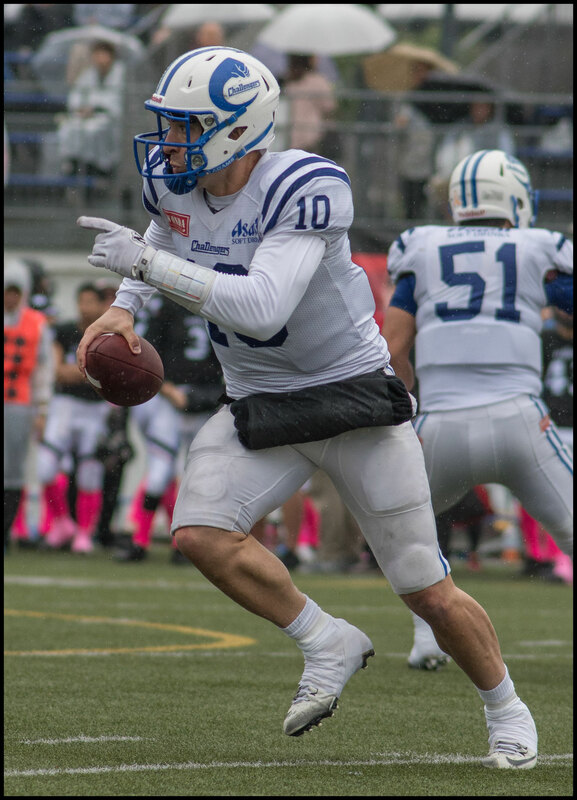 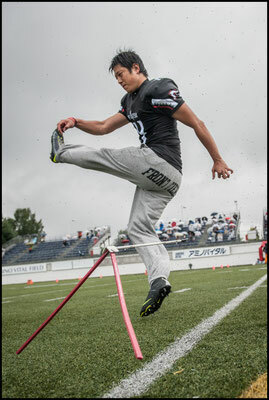 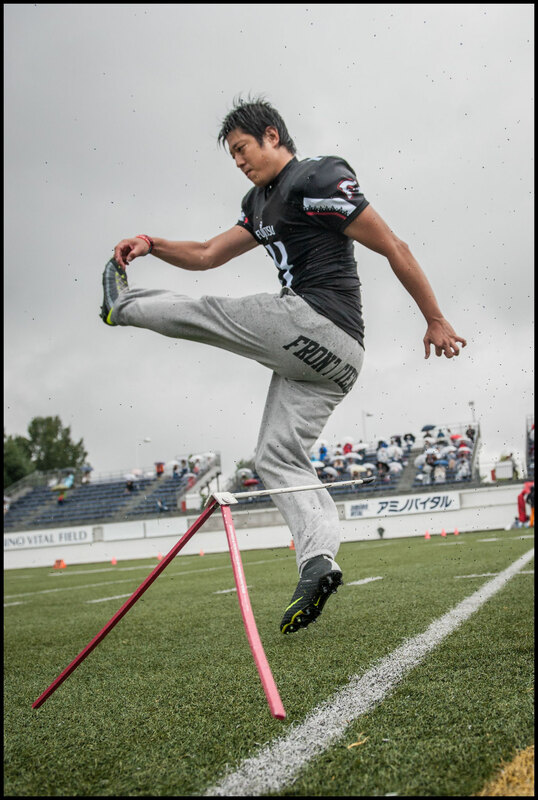 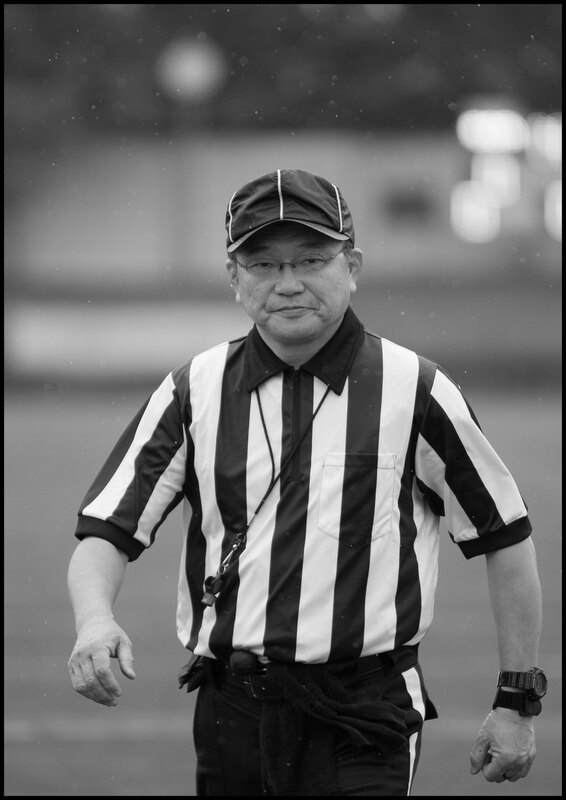 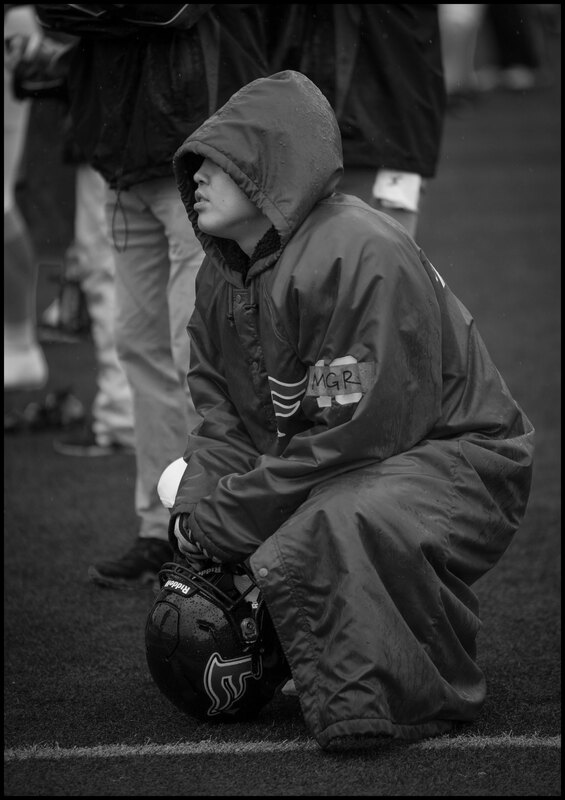 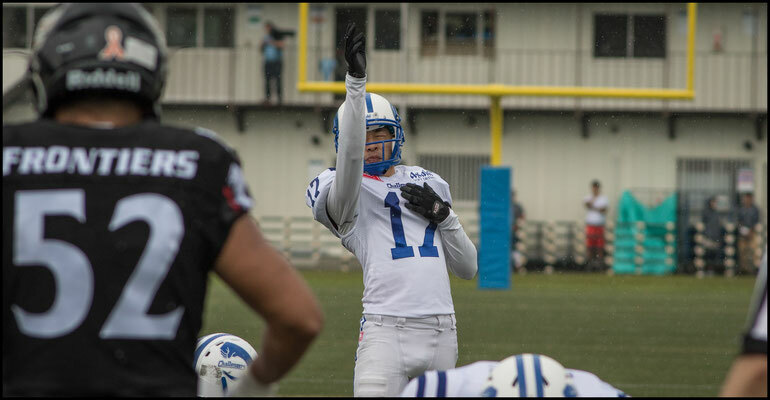 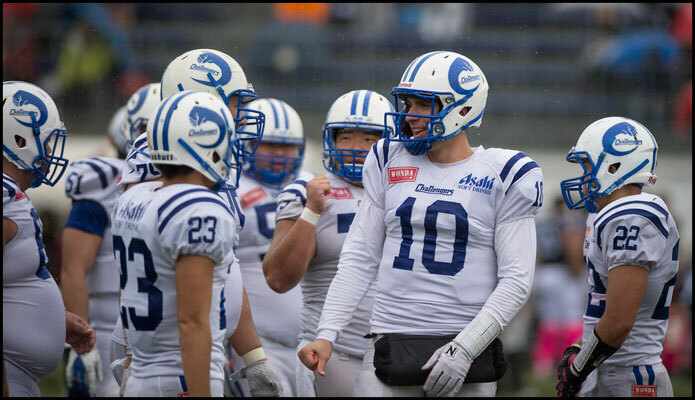 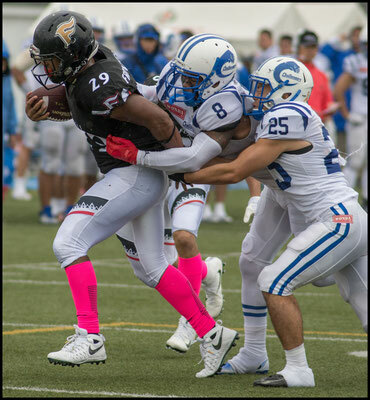 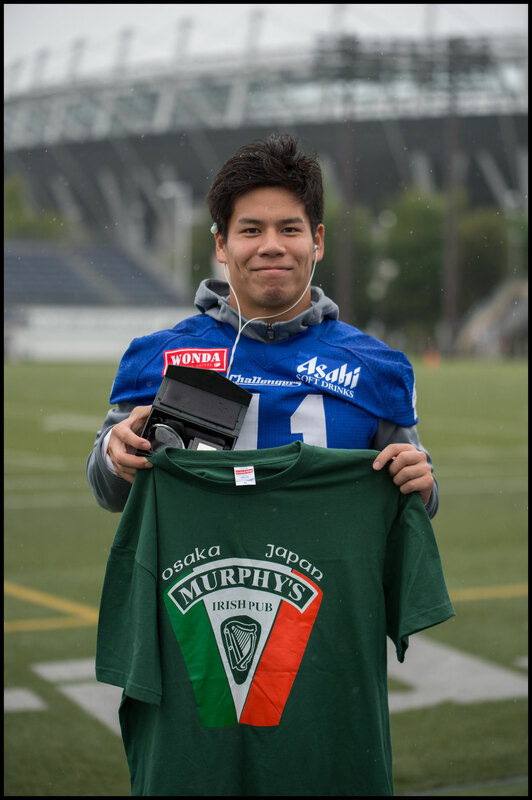 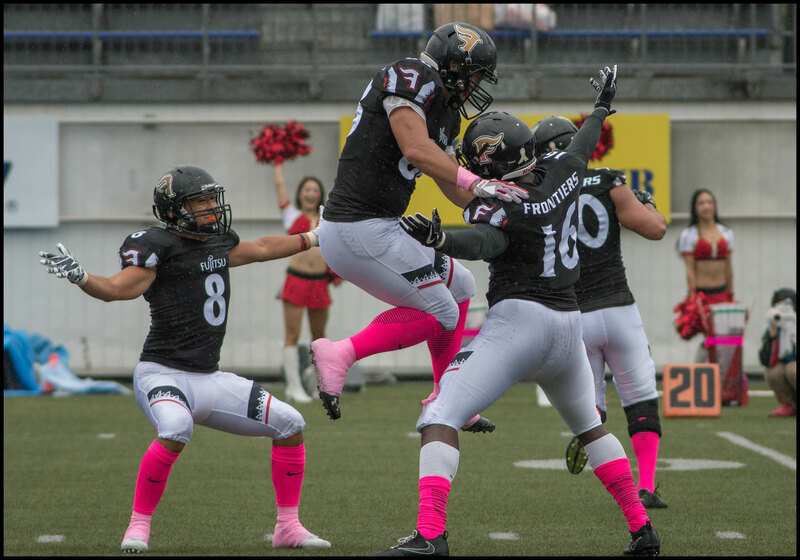 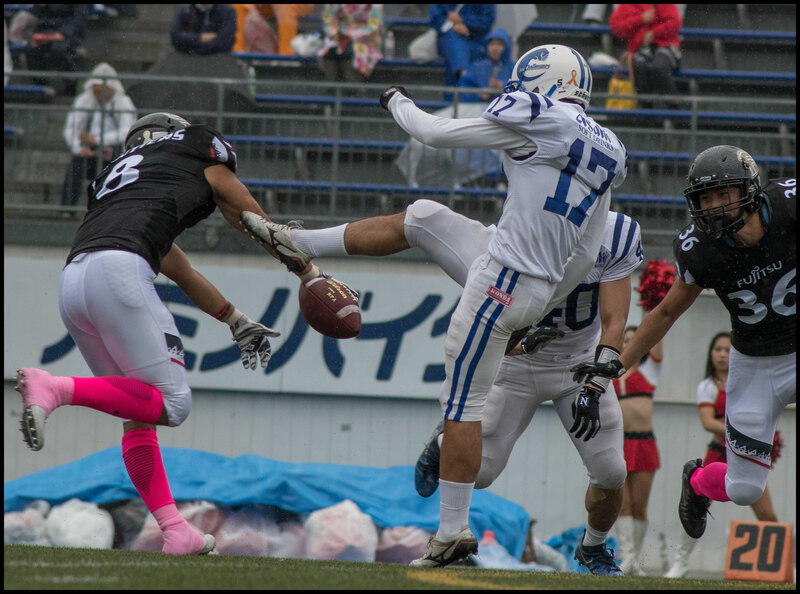 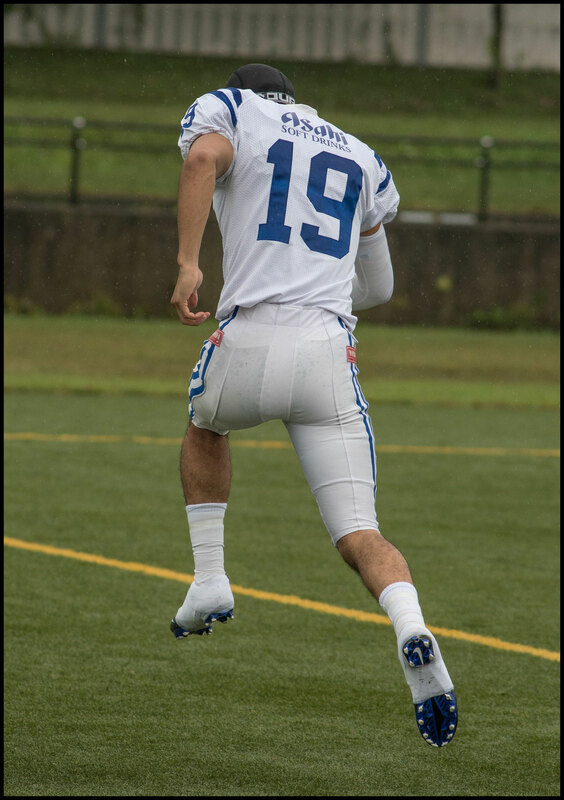 The conditions in Chofu made ball handling difficult, but didn’t bother Fujitsu’s five-time all-league kicker Hidetetsu Nishimura, who hit two 30 yard plus FGs early to get Frontiers off the mark. Star tailback Gino Gordon had a banner day. 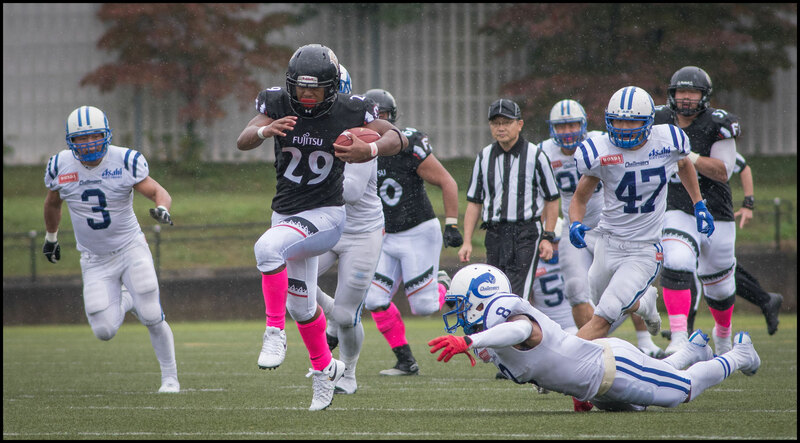 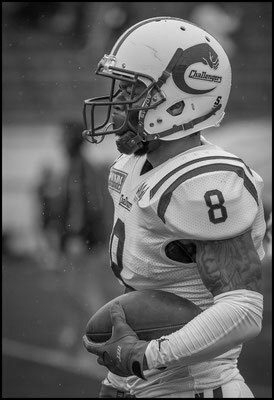 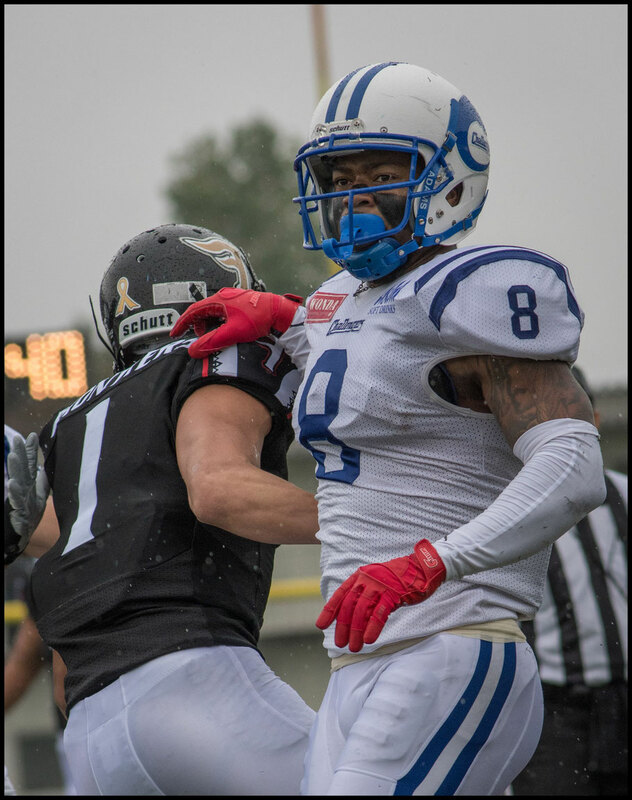 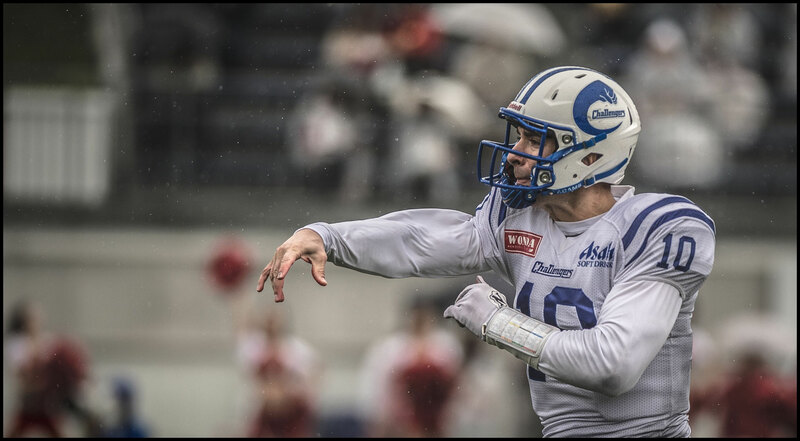 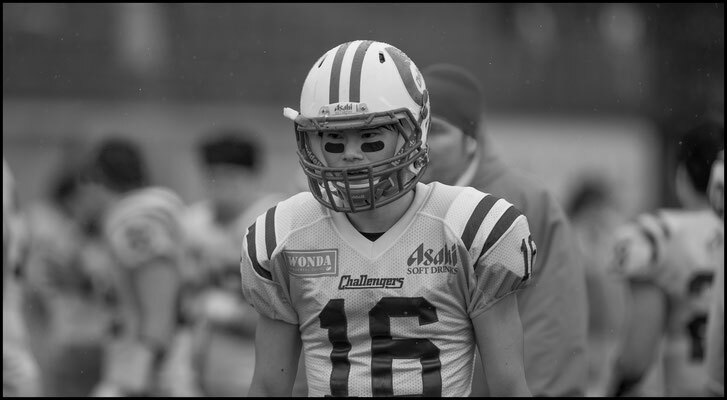 The veteran, perhaps out to make up for a 42- yard effort last week against Panasonic, carried the ball 17 times for 266 yards. 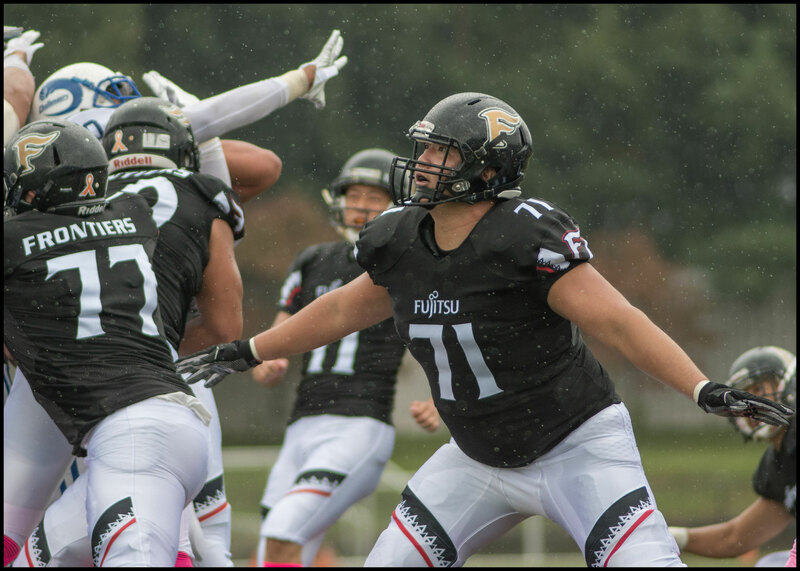 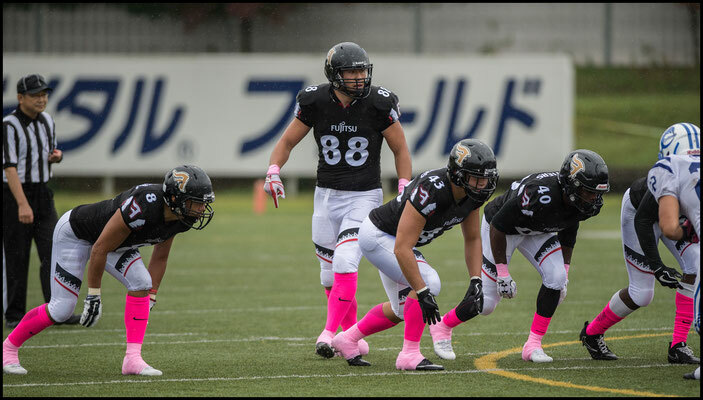 On Fujitsu’s first offensive play he gained 7 yards running right. 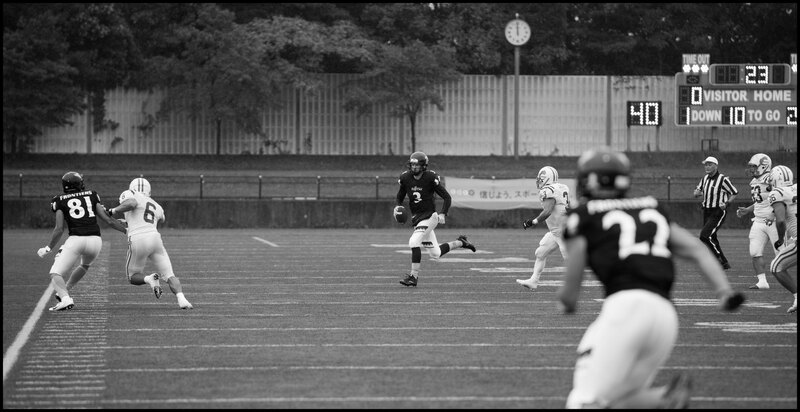 On the second he went left for nine. 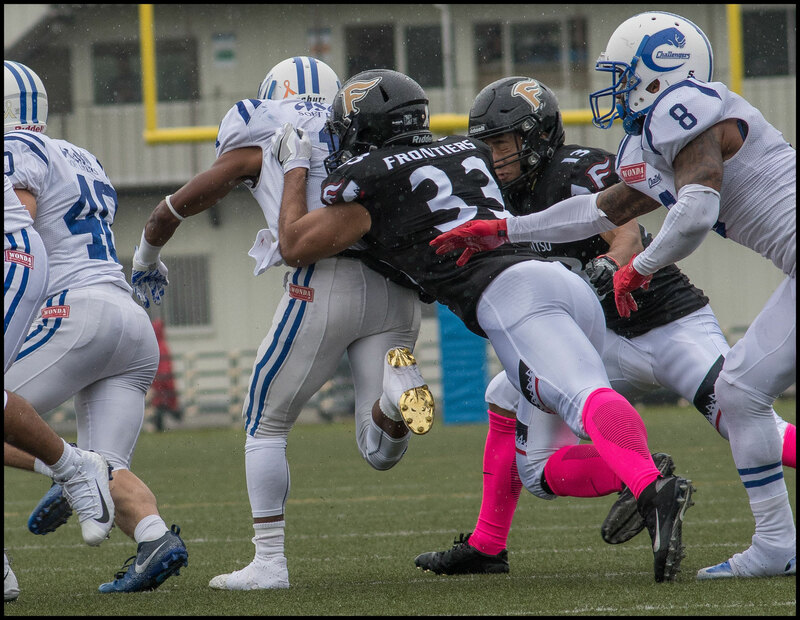 Two plays later he took a pitch left and only the speed of Clint Floyd prevented him turning the 31-yard effort into a TD. The Harvard grad though, could only be kept down so long. 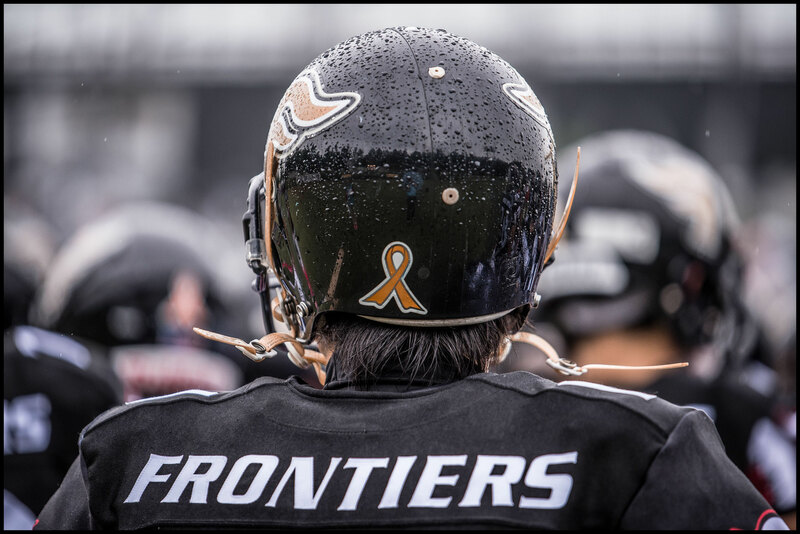 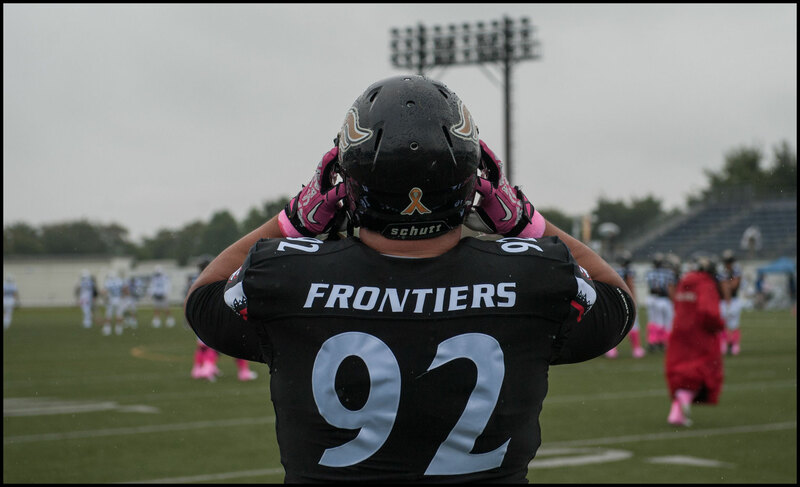 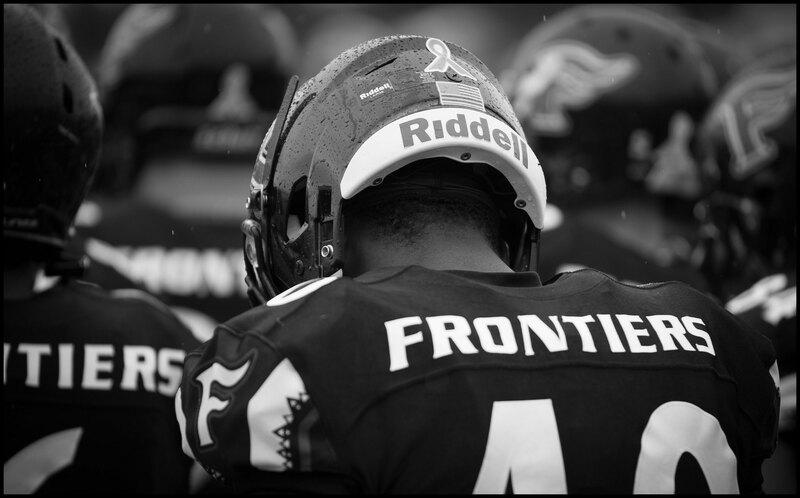 He tore off on a 97-yard screamer at the end of the first quarter to put Frontiers up 16-0. 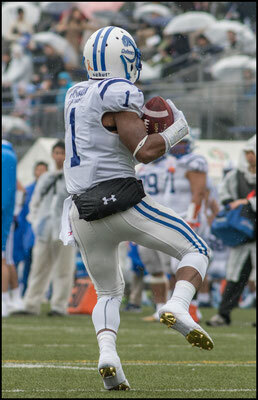 Taking the ball left Gordon hugged the sideline, turned on the afterburners and left everyone in his wake. 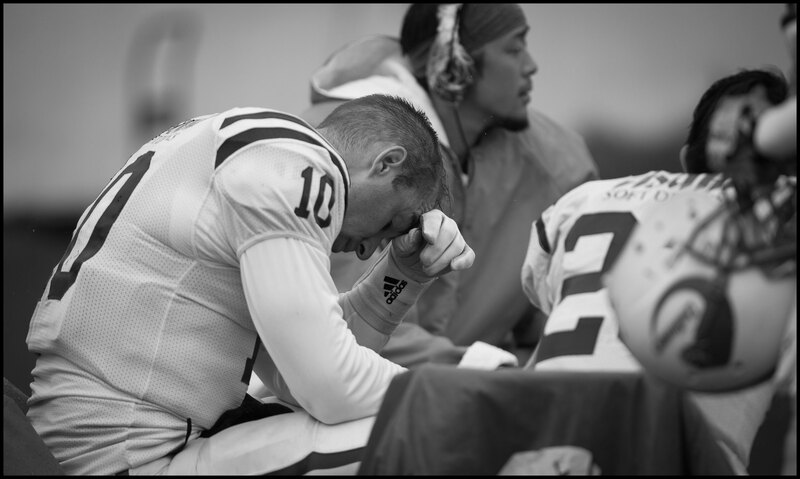 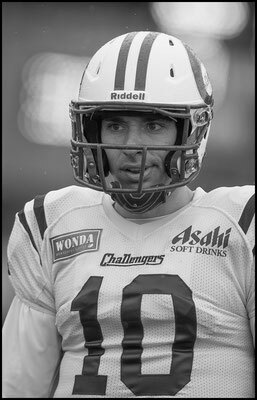 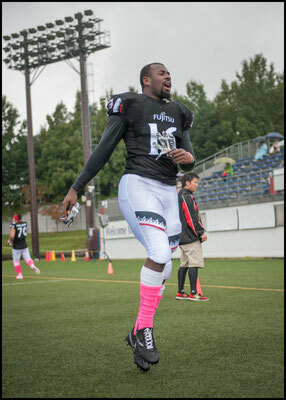 That score broke the game open and two 30-yard plus TDs from Cameron to Clark Nakamura in the second quarter sealed it. 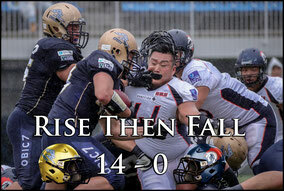 27-0 down at the half there was little chance the Challengers were going to claw back such a deficit. 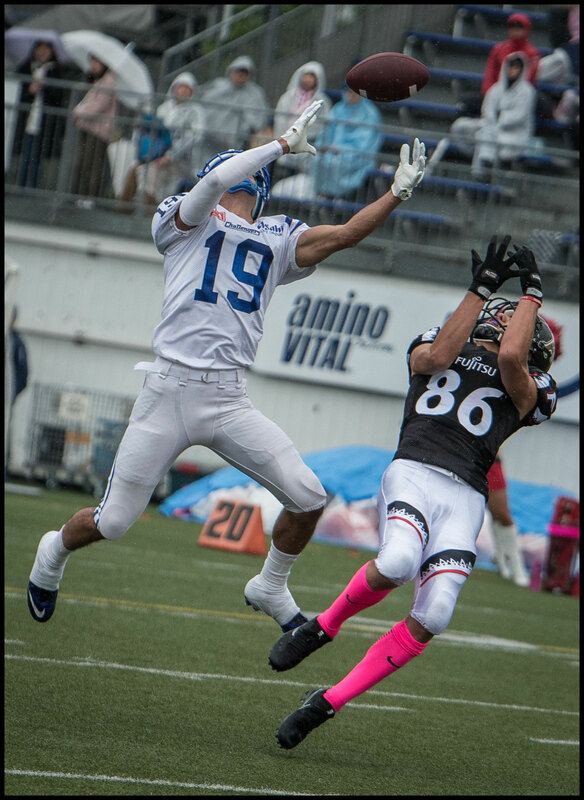 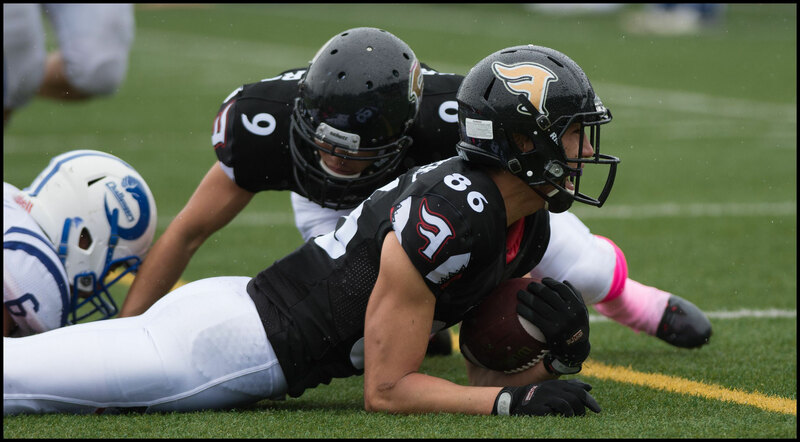 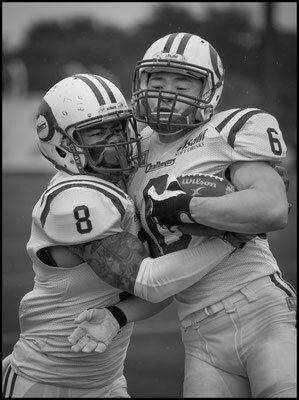 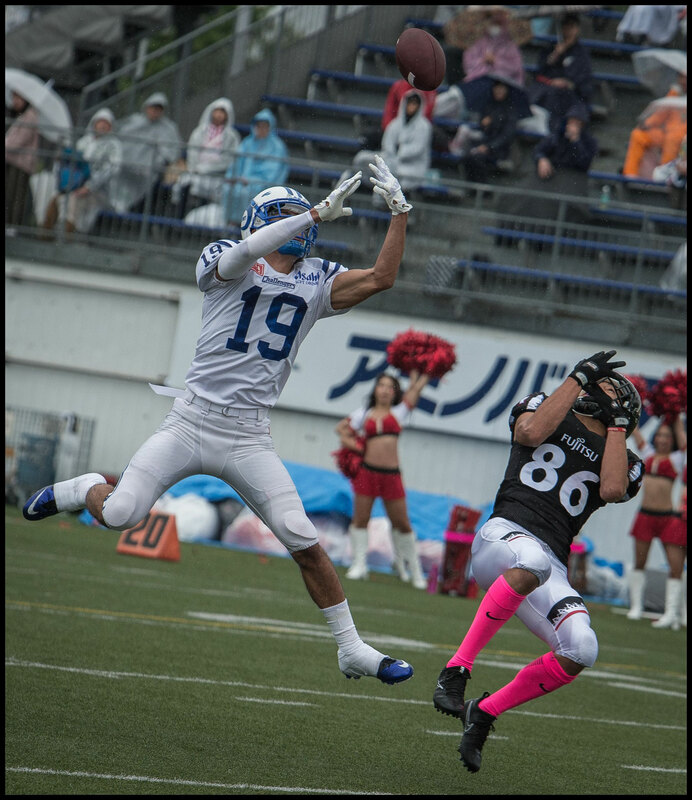 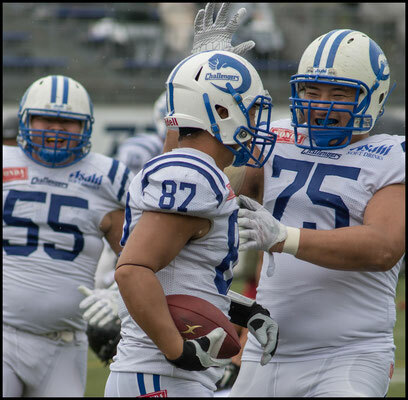 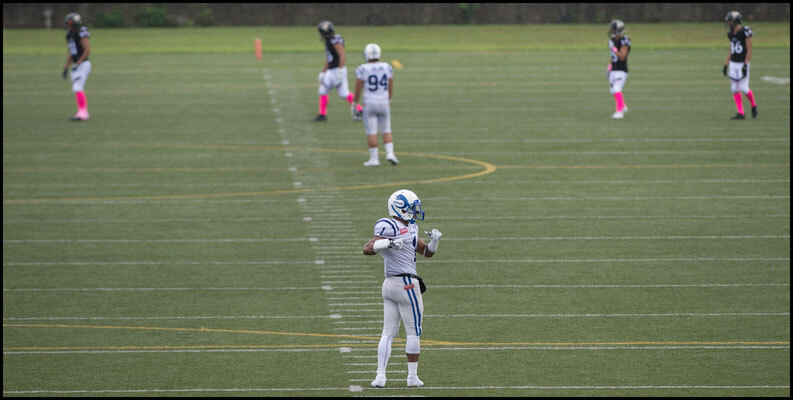 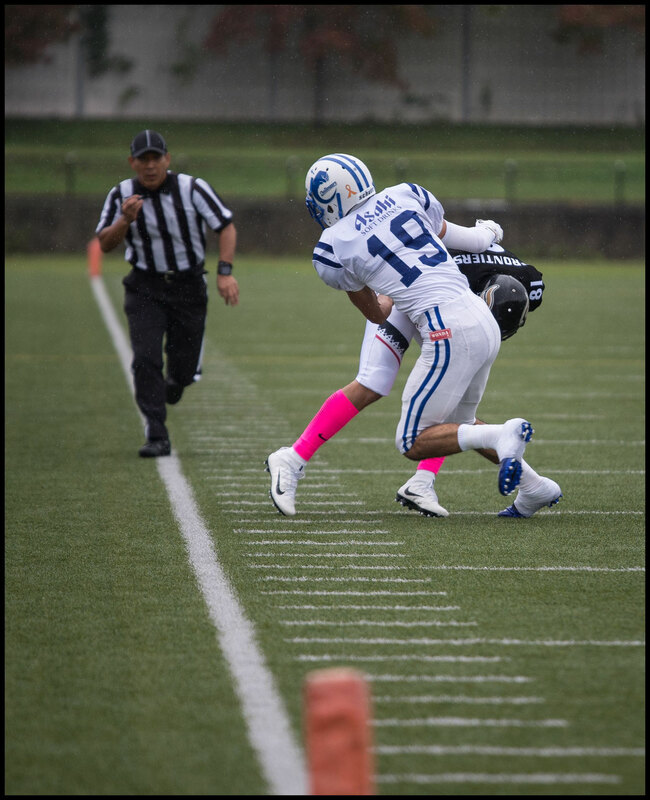 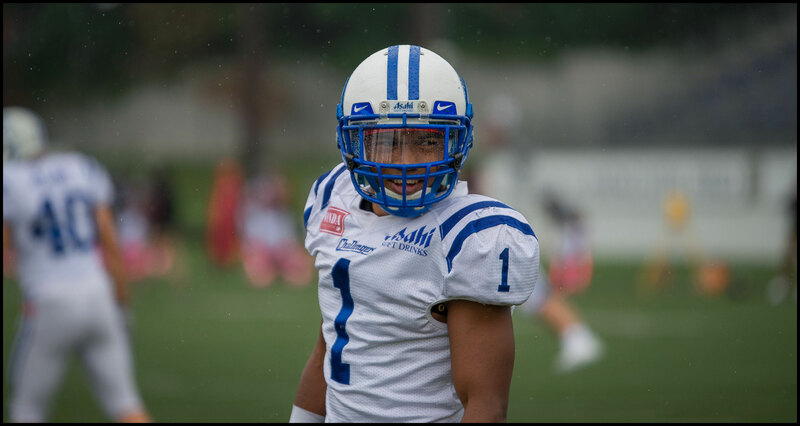 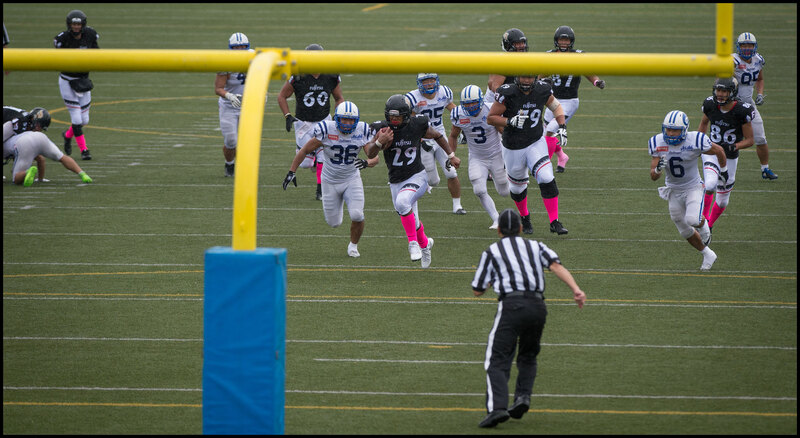 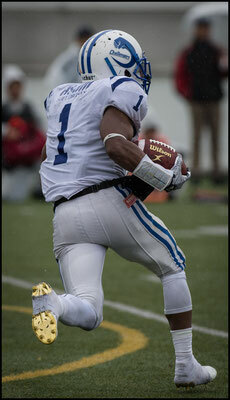 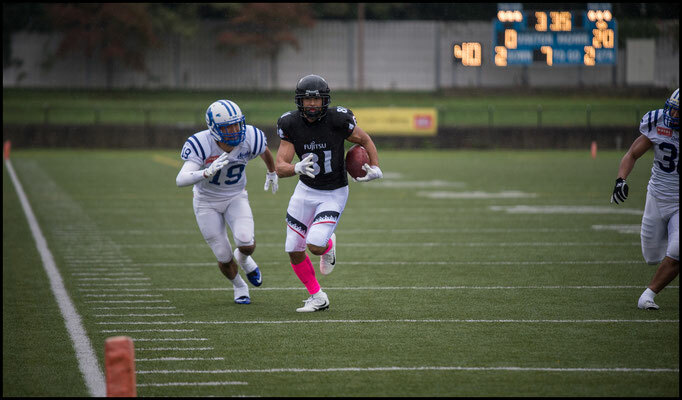 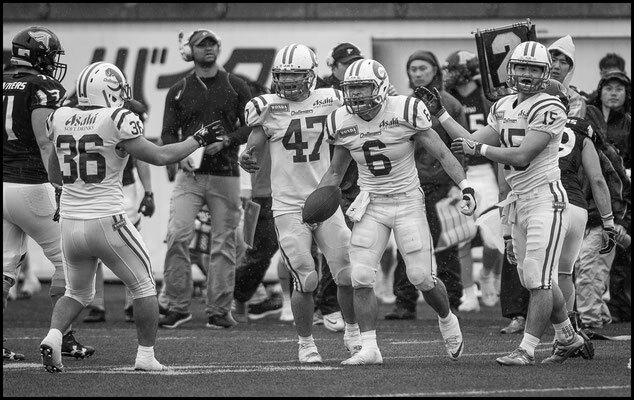 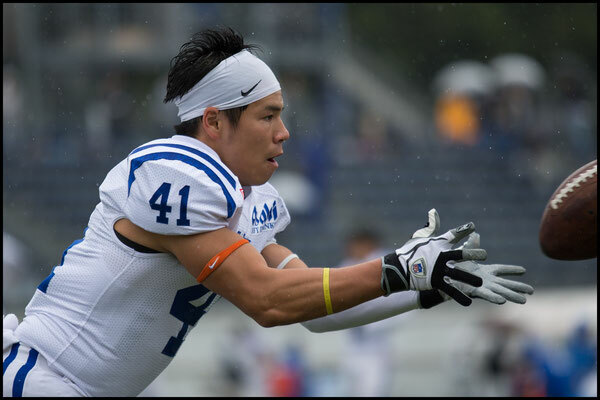 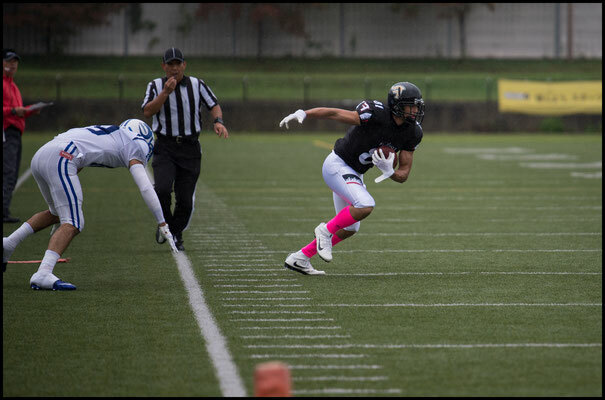 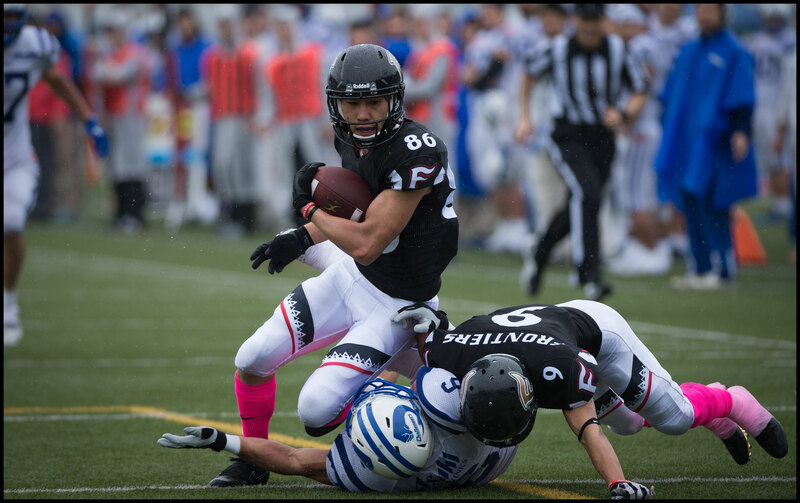 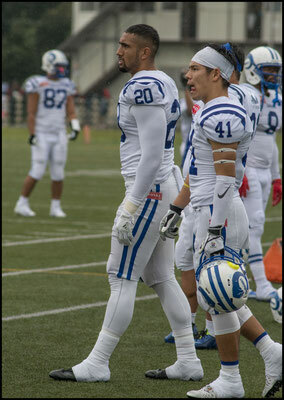 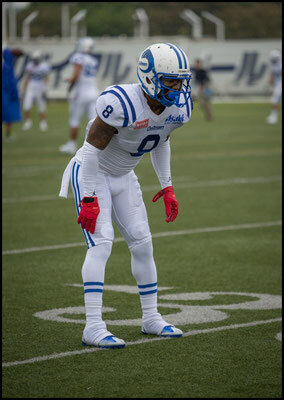 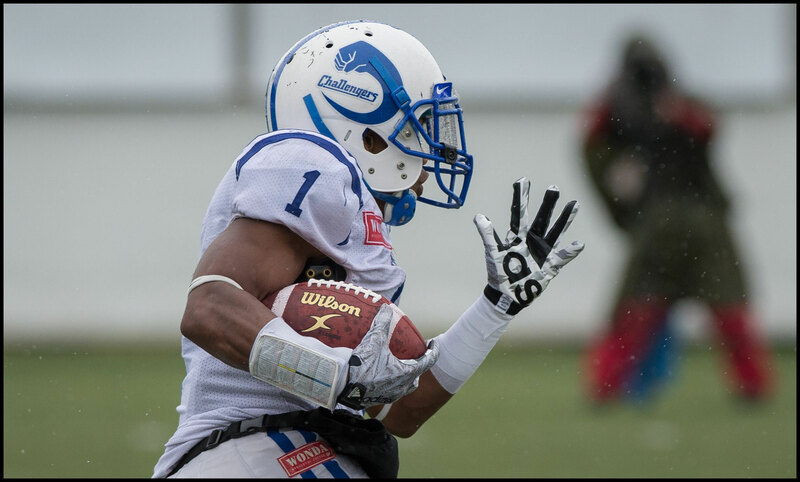 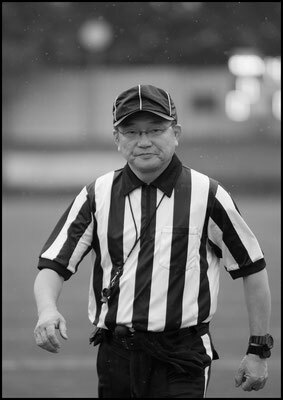 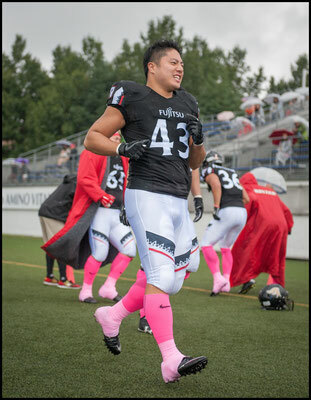 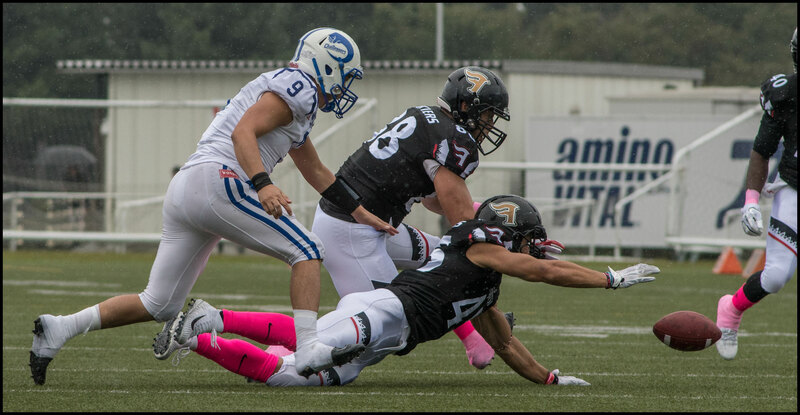 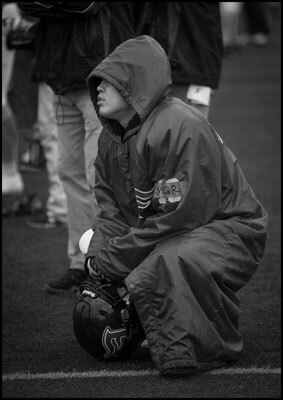 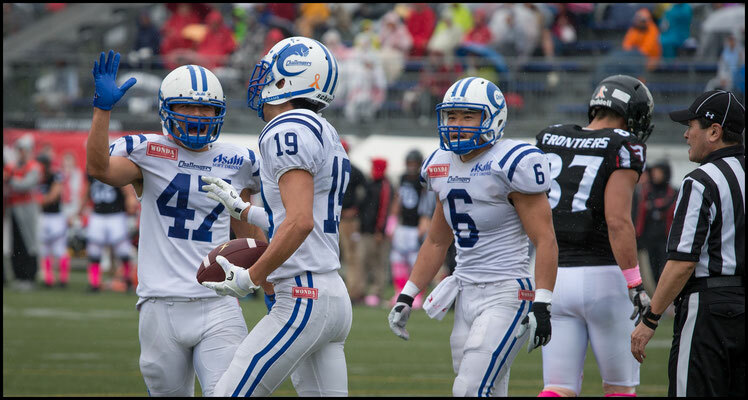 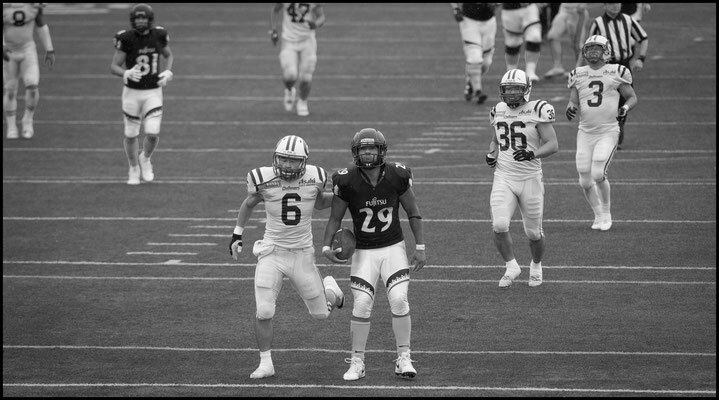 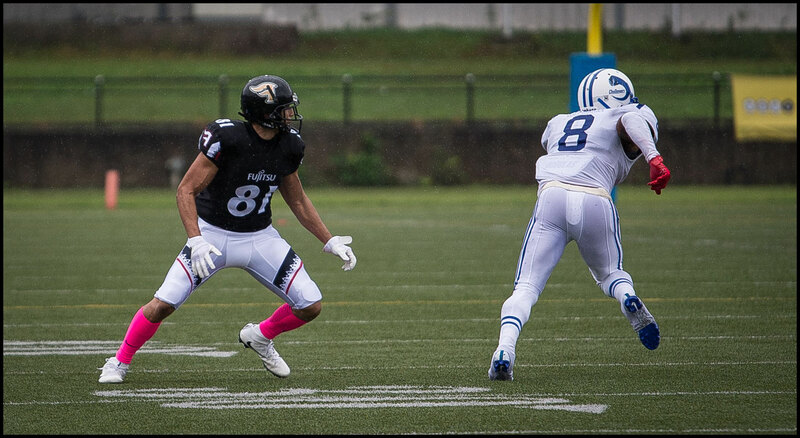 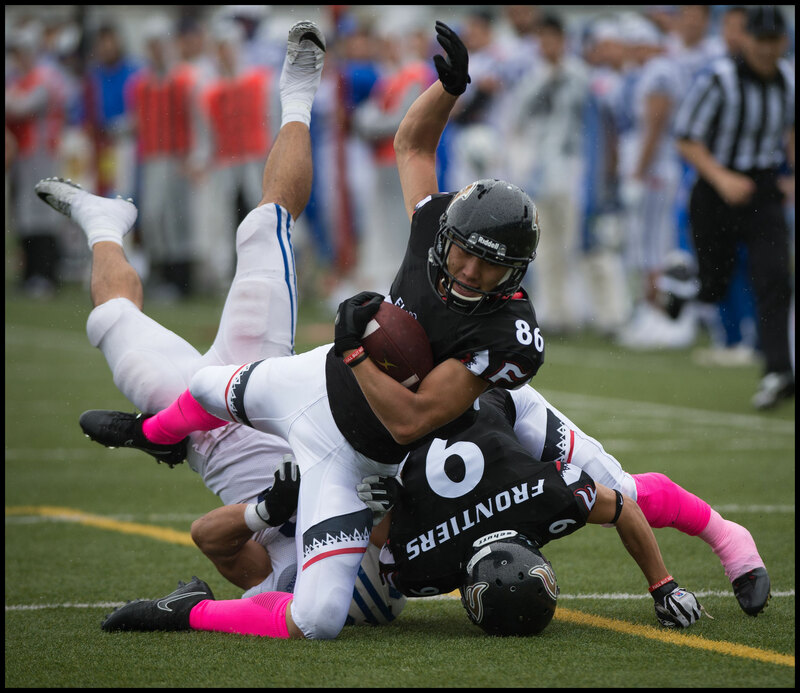 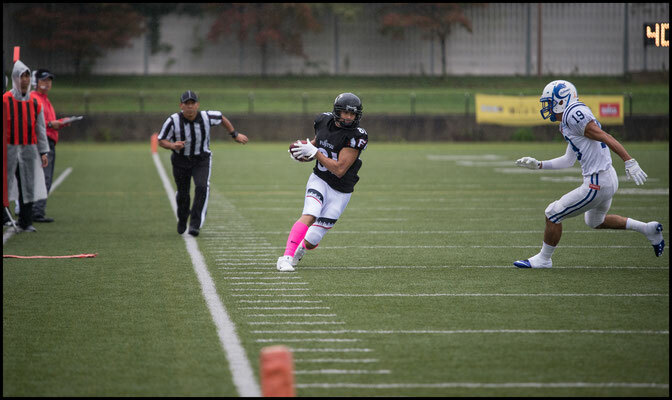 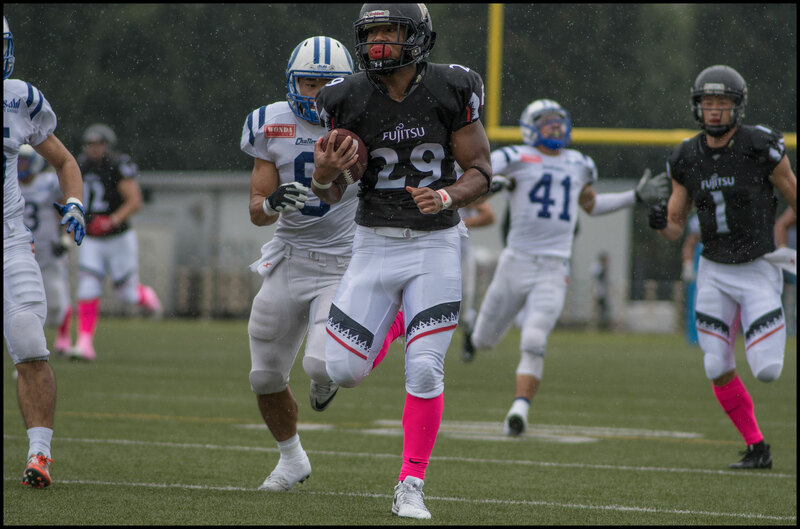 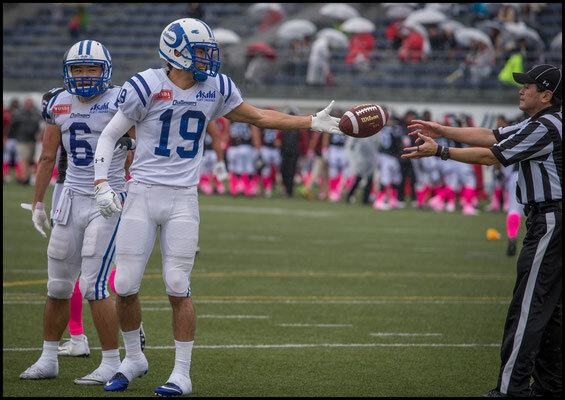 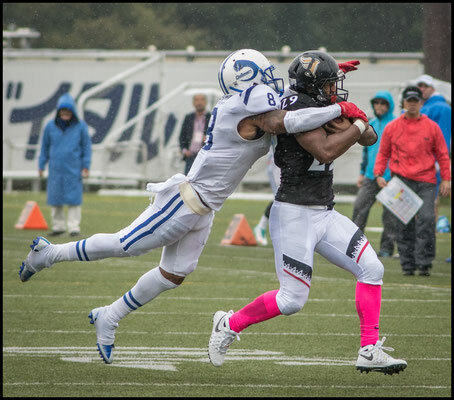 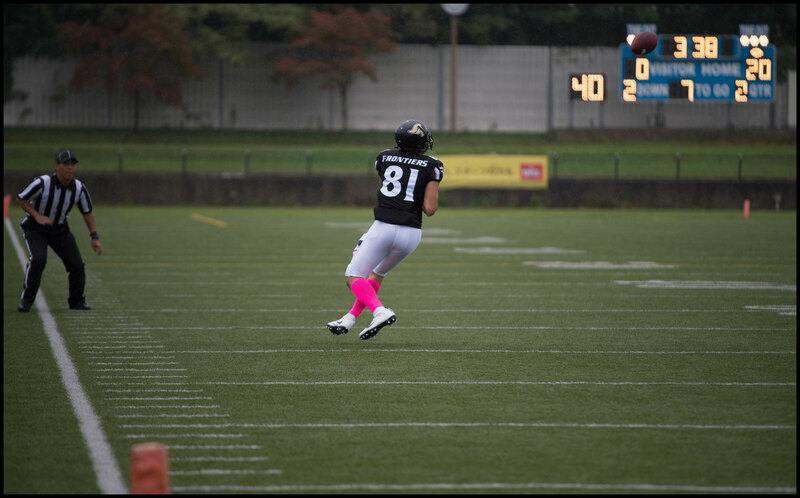 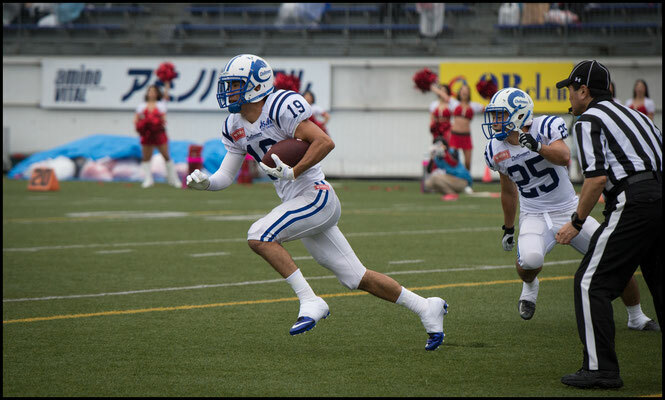 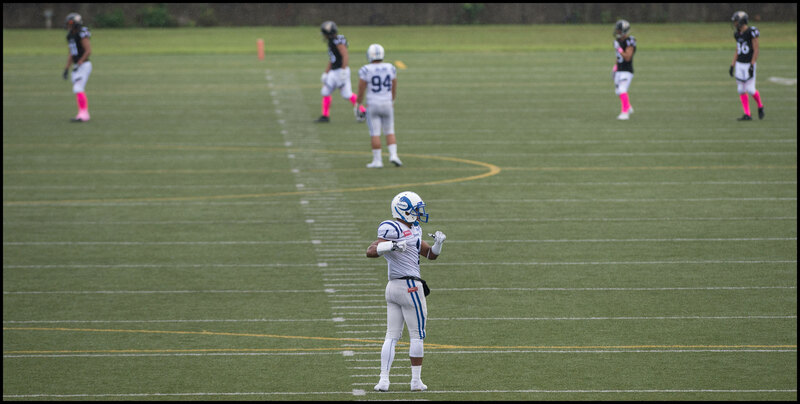 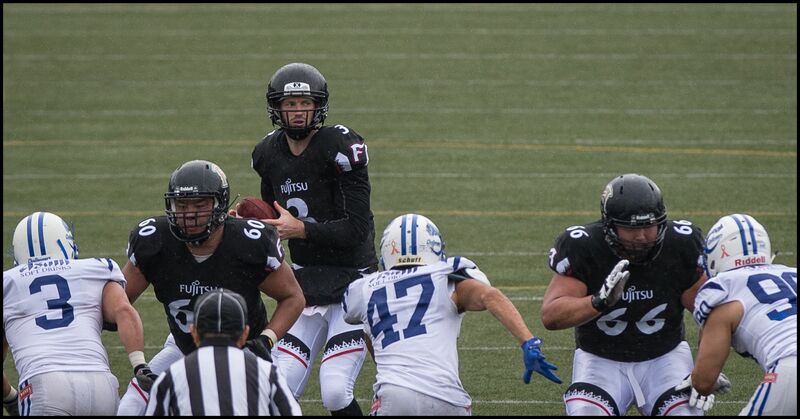 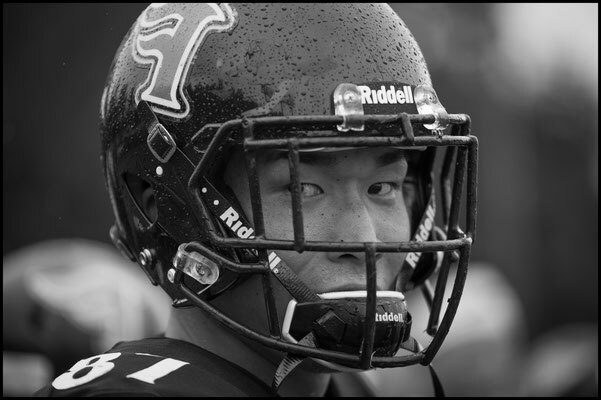 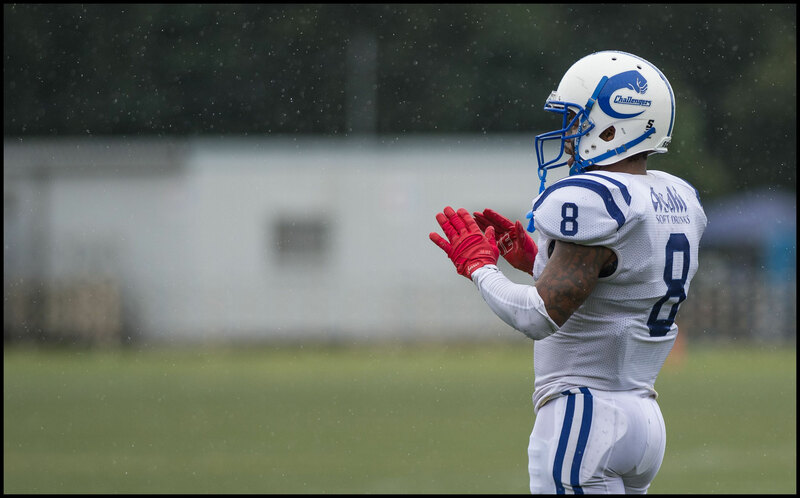 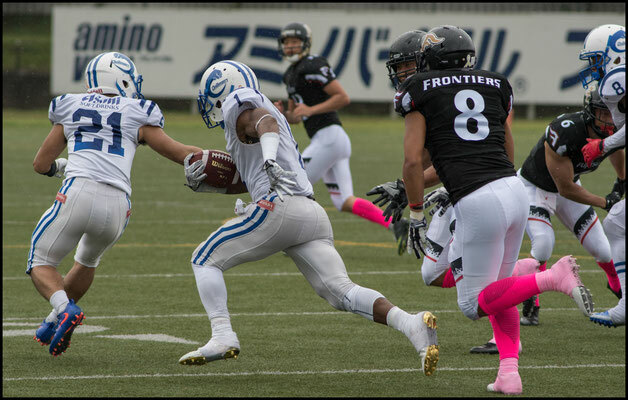 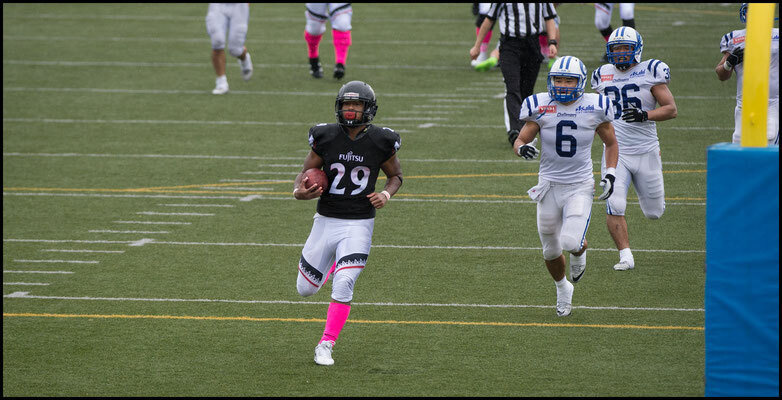 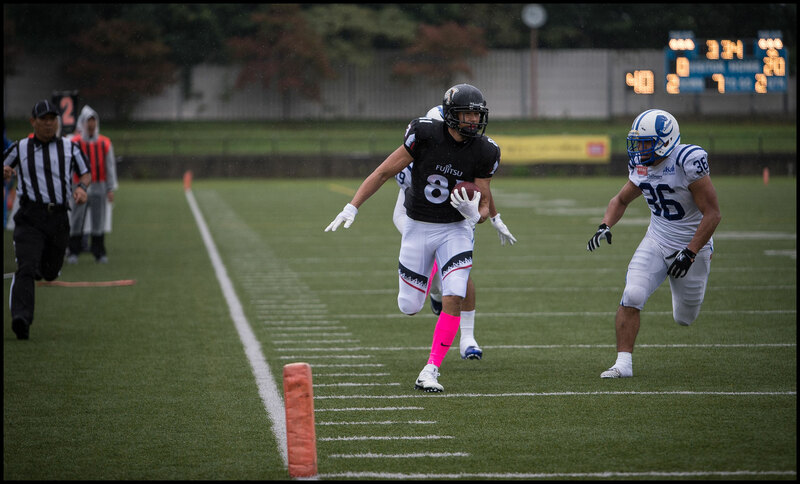 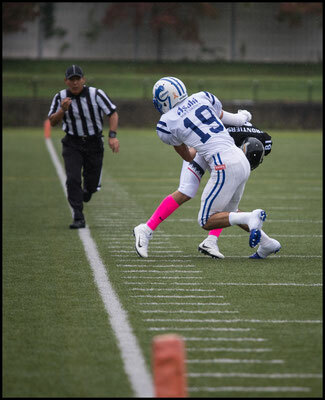 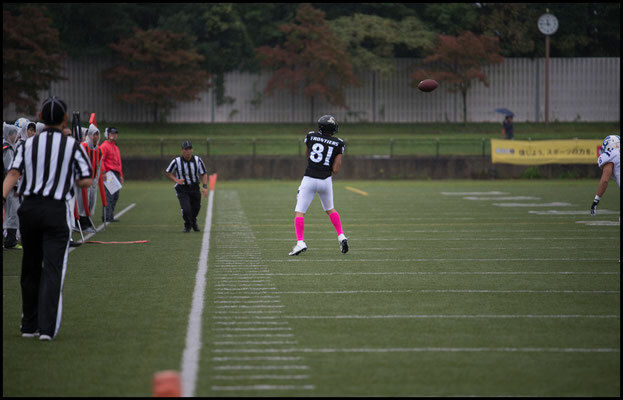 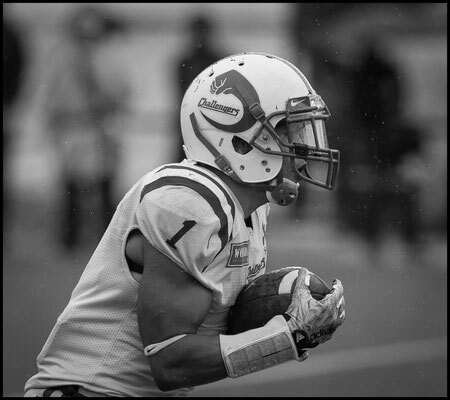 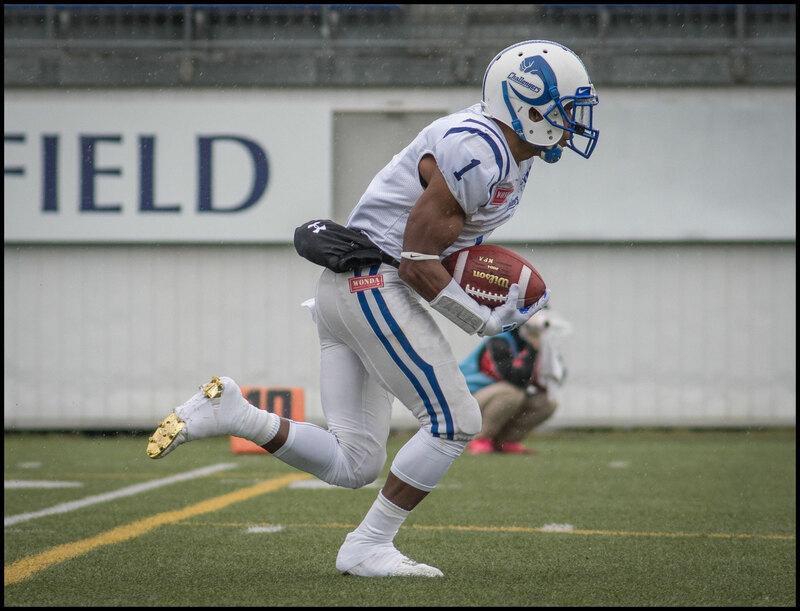 Nakamura’s second touchdown showed off his power and pace. 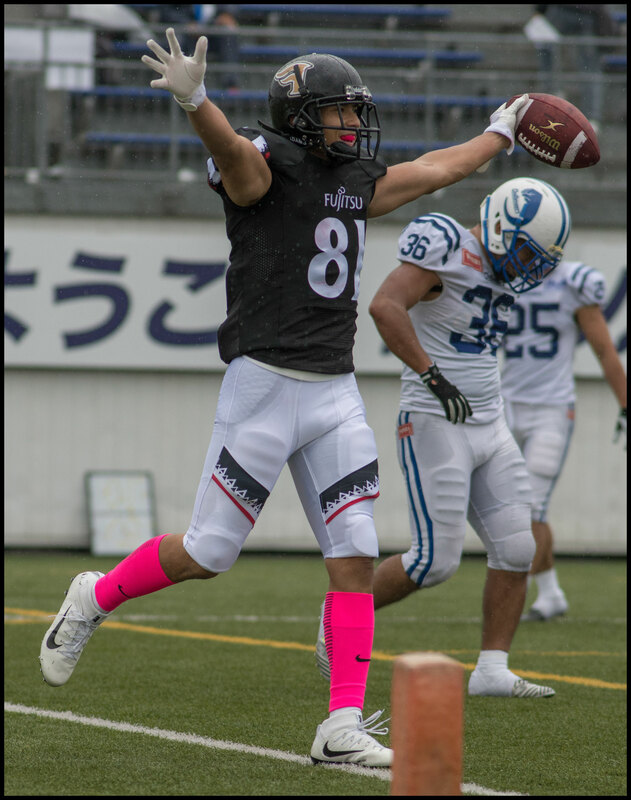 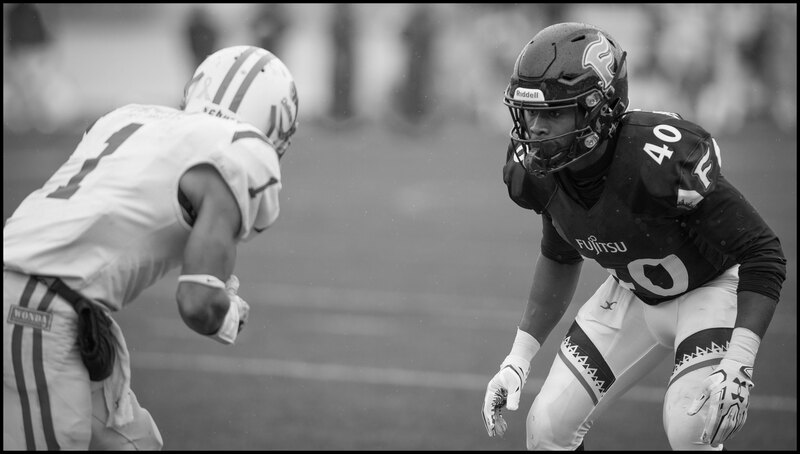 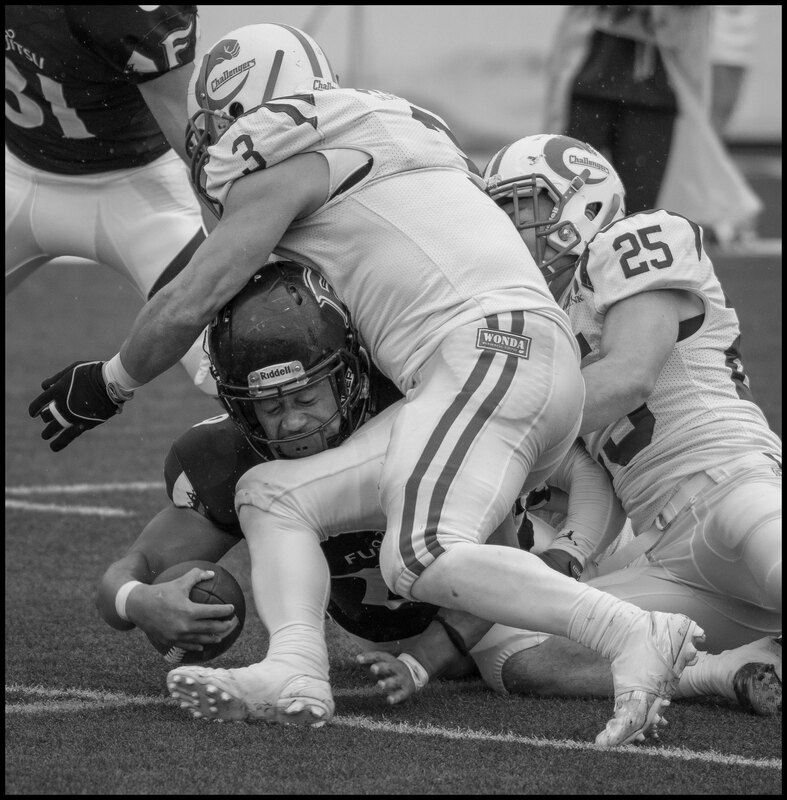 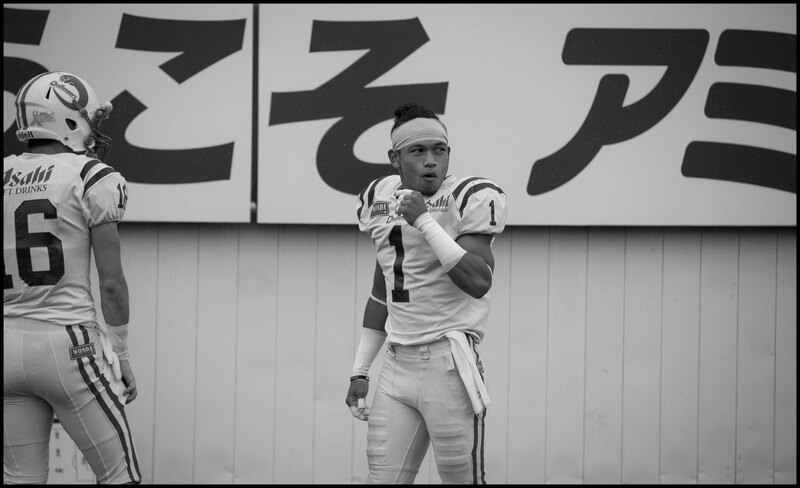 Grabbing a pass in the flat he stopped short and ducked low to shake off the tackle of rookie DB Taisei Yamamoto, then outpaced LB Takayuki Mizuda to the corner of the endzone. 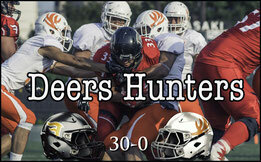 Credit to the Challengers though, they never let their heads drop and kept the energy up all game long. 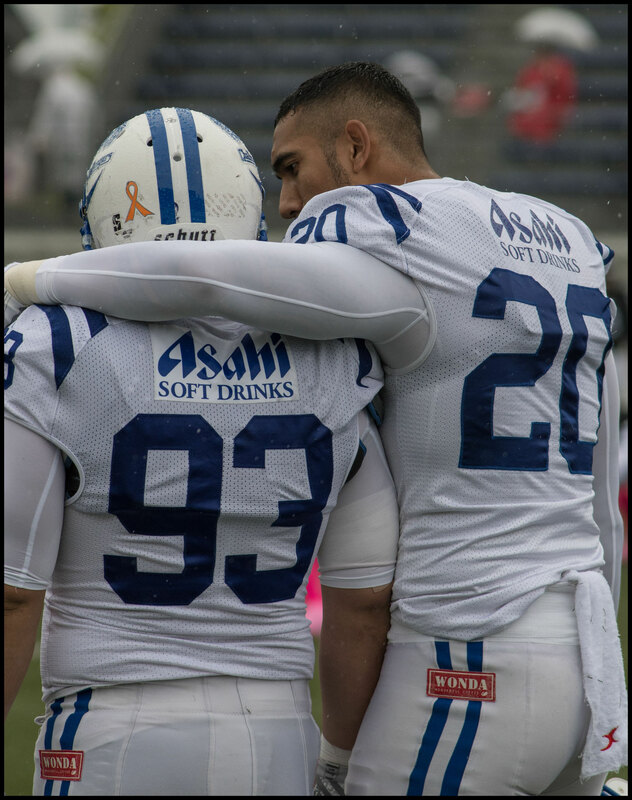 The Kansai side got their reward in the third quarter. 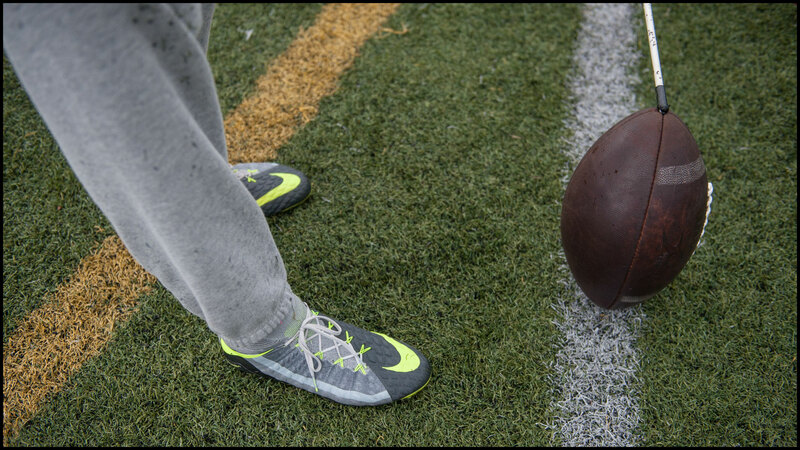 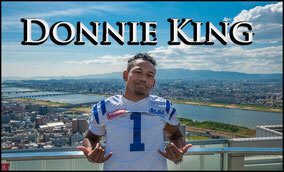 Donnie King took a kickoff all the way down the left sideline weaving and bobbing to the five-yard line. 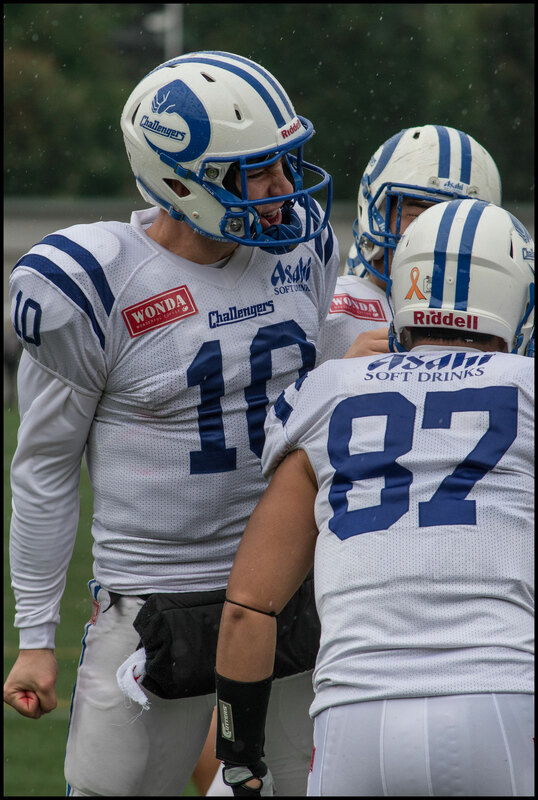 On the very next play QB Alex Niznak rolled out to his right bought some time and hit TE Yudai Yoshikai back across the center for the TD. 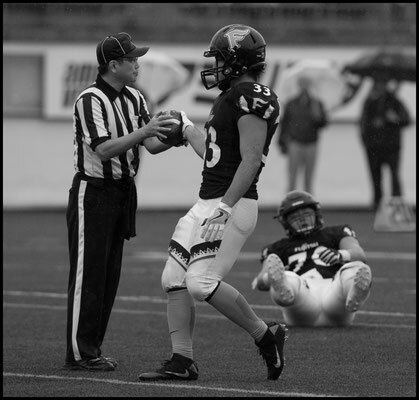 The third quarter was particularly action packed. 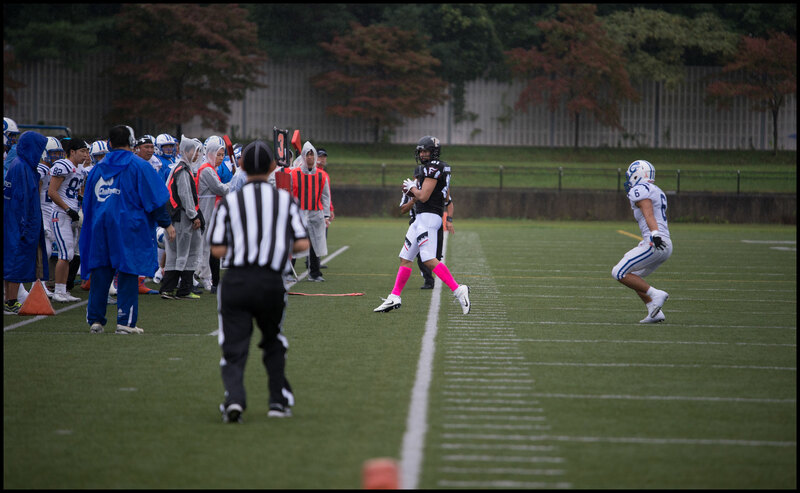 A long bomb attempt to King was followed by an interception when Niznak was hit just as he released the ball. 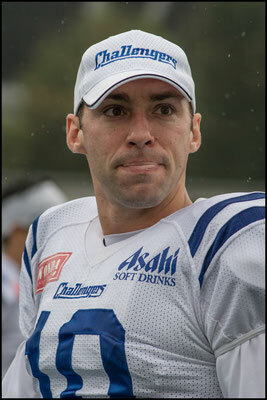 Challengers also had one of their two picks off Colby Cameron in the period. 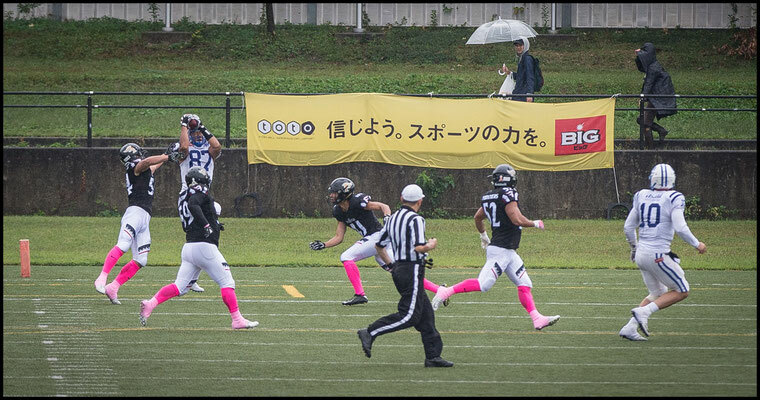 Gordon hit another 30-yard home run later in the same period before fellow halfback Kazuki Takaguchi scored from short range in the fourth. 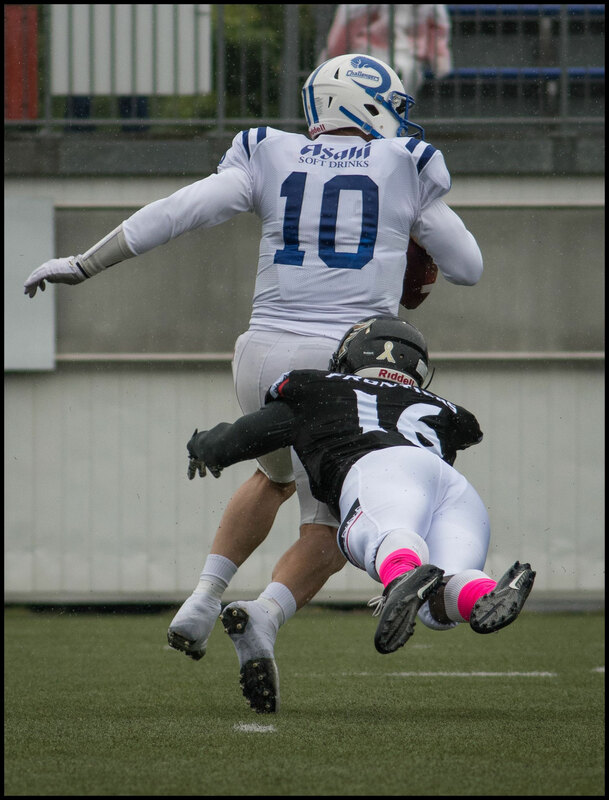 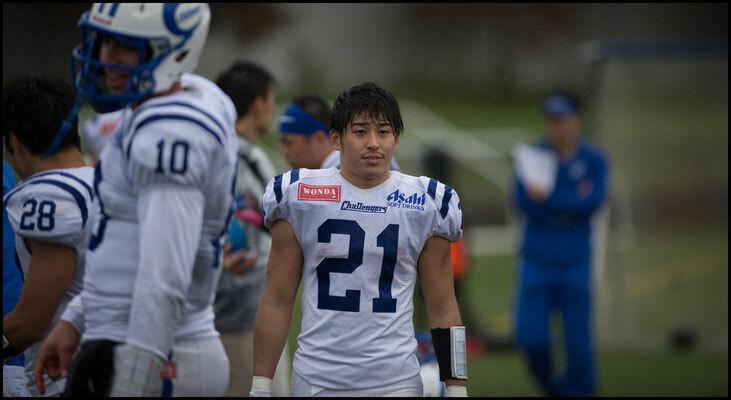 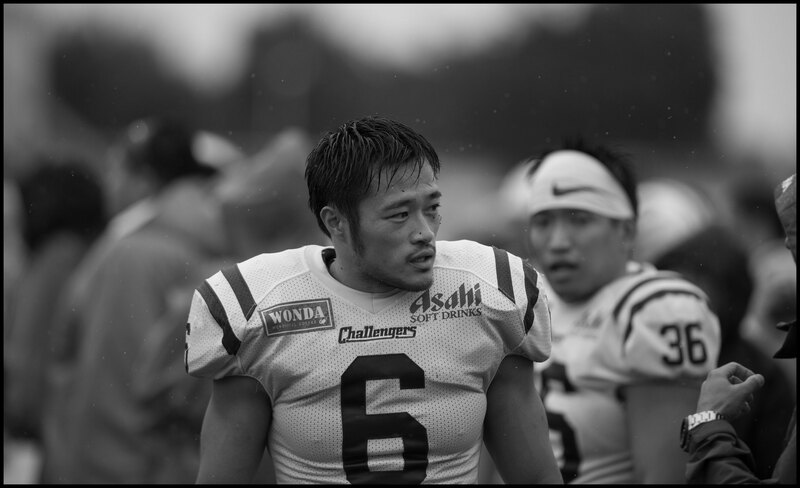 Challengers finished off the day’s scoring with a two-yard dive by RB Masaki Kawabuchi through a hole OL Haruhisa Kurokawa made by pancaking LB Akinobu Takasaki. 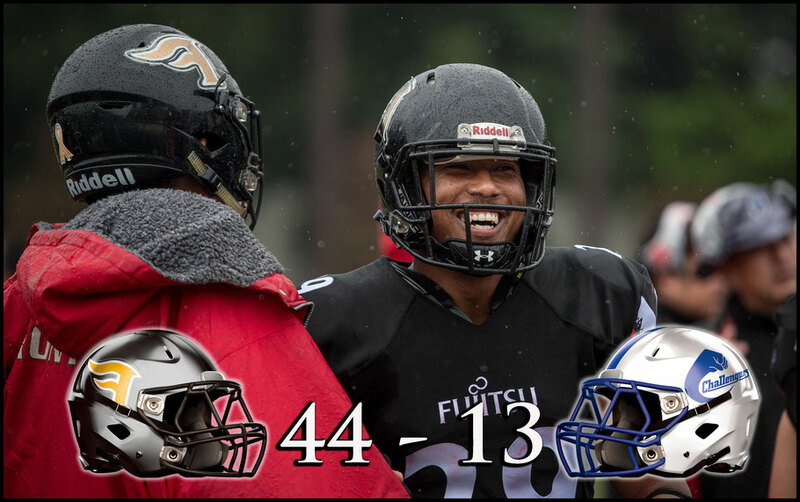 For the Challengers Floyd stood out. 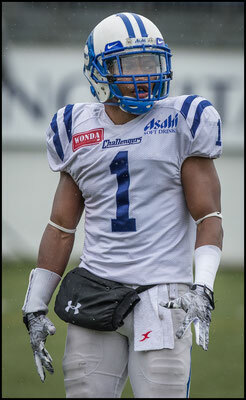 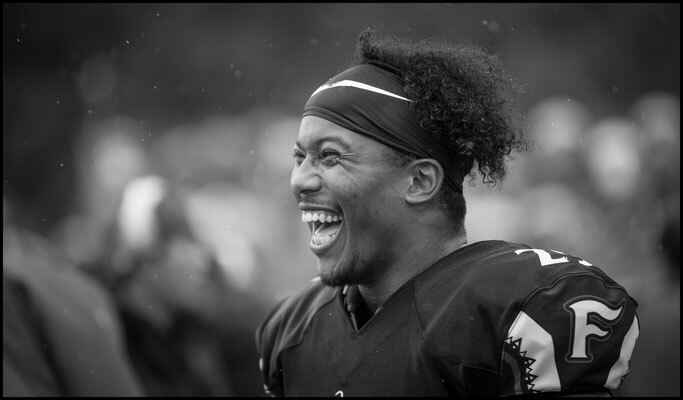 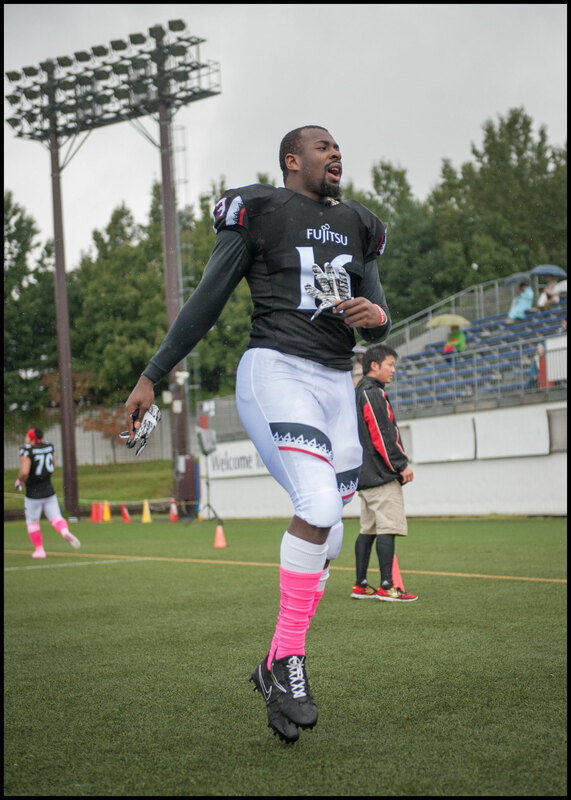 The former Arizona State Sun Devil was constantly around the ball on defense and led his team with 3.5 tackles. 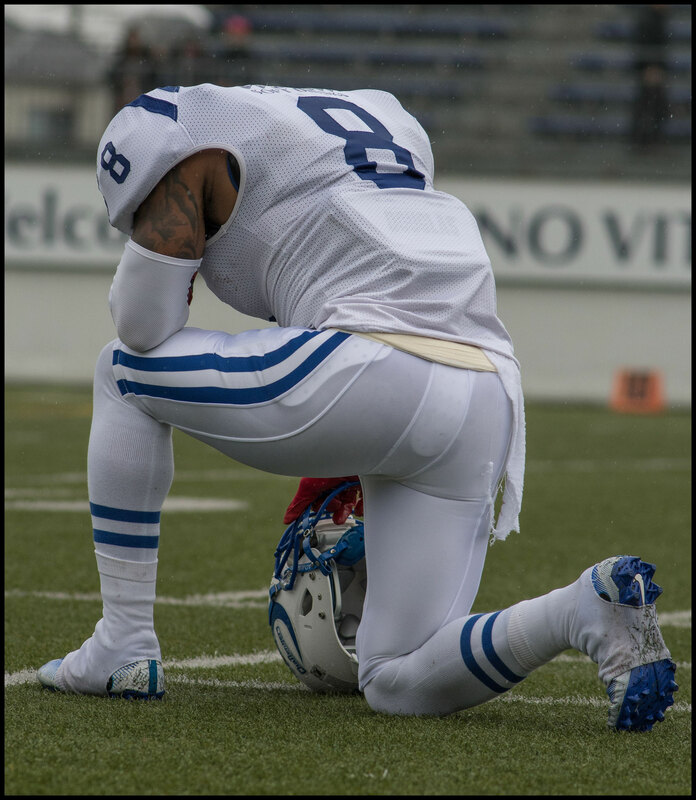 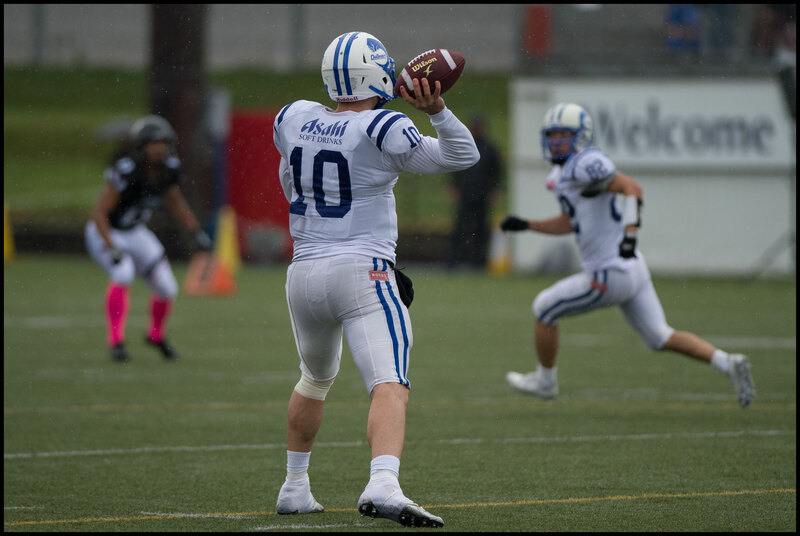 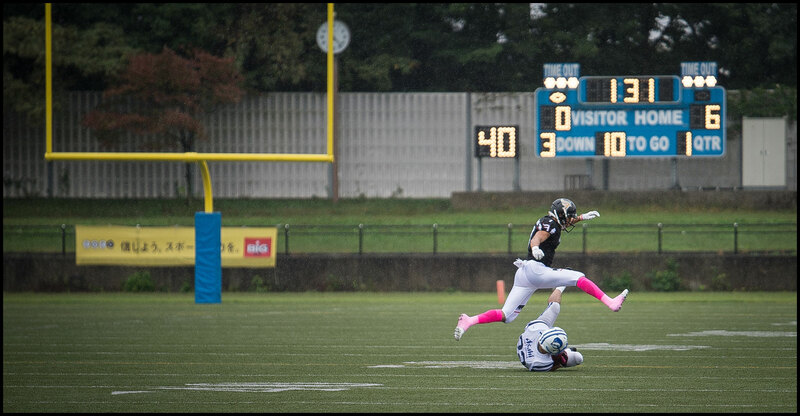 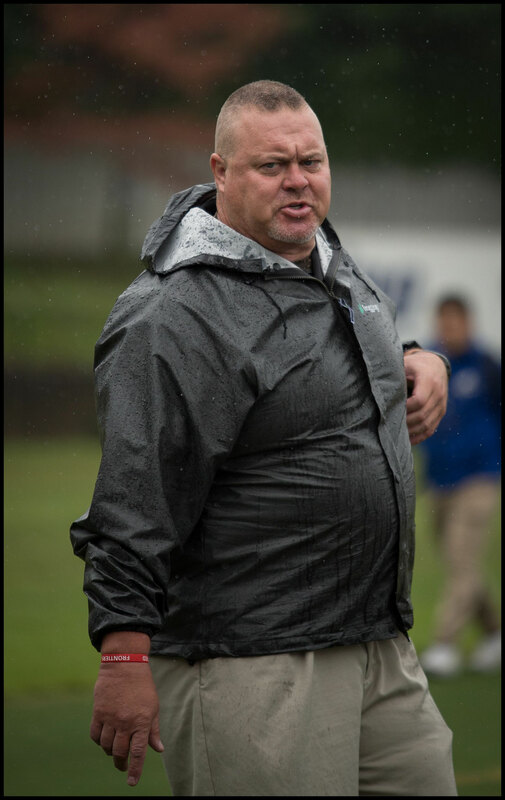 He also returned three kickoffs, two punts and made a thundering special teams tackle early in the game. 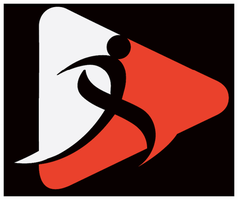 Asahi may have lost the game but Finies heavy defeat of Silver Star means Challengers are assured of finishing no worse than eighth in the Super Nine and so qualify for the playoffs. 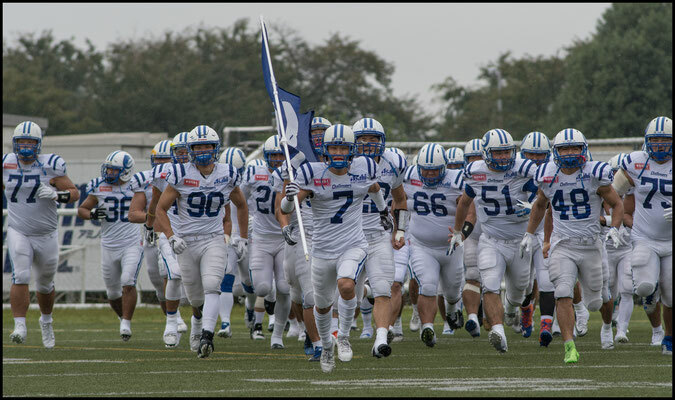 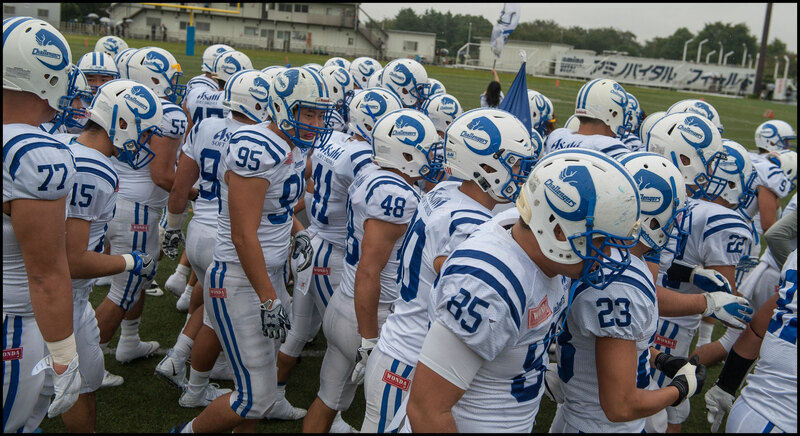 They’ll have a chance to improve on that standing when they take on Lixil Deers in their final regular season game. 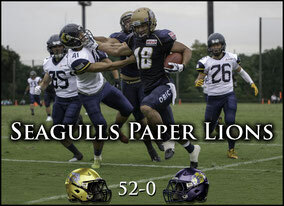 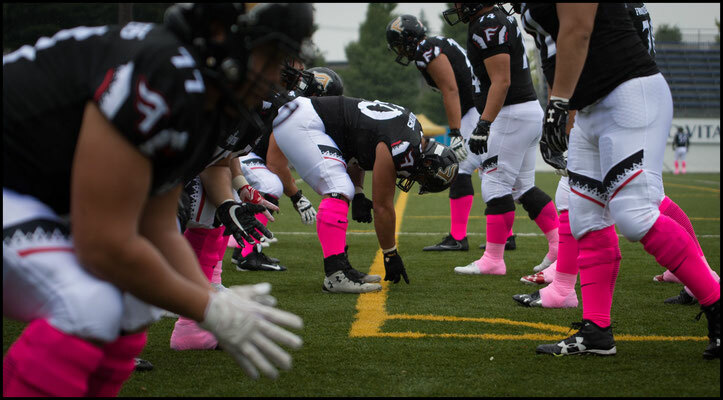 Fujitsu meanwhile will face off against Obic Seagulls, the team they defeated in last years Japan XBowl. Both games take place on October 29th.